Wednesday was another packed and wonderful day at Tulgey Wood! Josh's day started while most of us were still sleeping. "I went to the dump, threw the trash away. Then I had donuts with Mike. 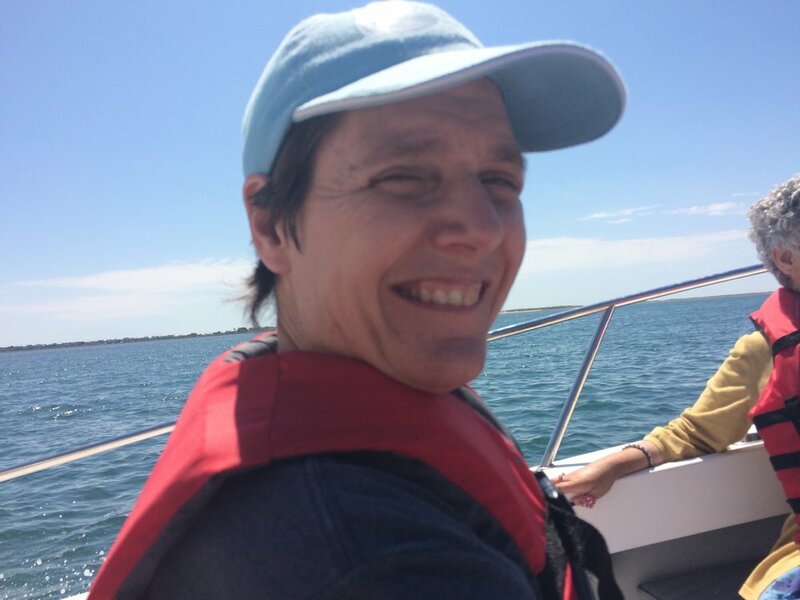 Then after breakfast I got to go on a boat and I got a hat." A group of 9 people went out to breakfast at Downy Flakes, while the rest of us ate breakfast here. It rained on and off all morning, but cleared up by the time we finished with contributions and music class. Josh, Thomas, Mike, Meg and Akeira went out for their boat trip, and got back in time to join art and drama classes. Meg said, "It was so relaxing and thrilling at the same time. I love when the boat goes fast and goes over the bumpy waves and my hair blows wildly in the wind. We couldn’t go to the island we normally go to because of the rough waters." 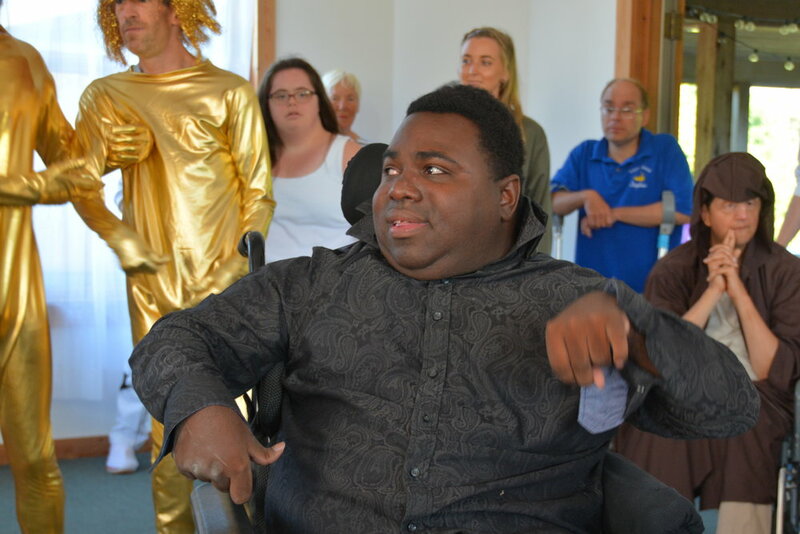 Peter said, "First thing this morning we practiced our songs for the play. That was beautiful. I enjoyed myself. Monik helped me learn the words." We have to let our pottery dry before it gets fired, so in her art class, Elinor taught us to tie-dye. Many of us made multi-colored shirts using white shirts Elinor brought with her. We tied strings and wrapped rubber bands around sections of the shirts, in the front, back, top, bottom, and sleeves. Then we dunked the shirts in water, and followed that by dunking portions of them in dye. When Elinor opened up all the ties and hung them to dry, we were happily surprised by how beautiful they came out. Lots of people had stained hands after tie-dying. In the afternoon, we had a scavenger hunt downtown. Some of the tasks were: going to the library to read a book on whales, taking a picture of someone wearing Nantucket red or white pants, getting into a boat or car, finding expensive art or jewelry, asking someone out on a date and asking for their number. 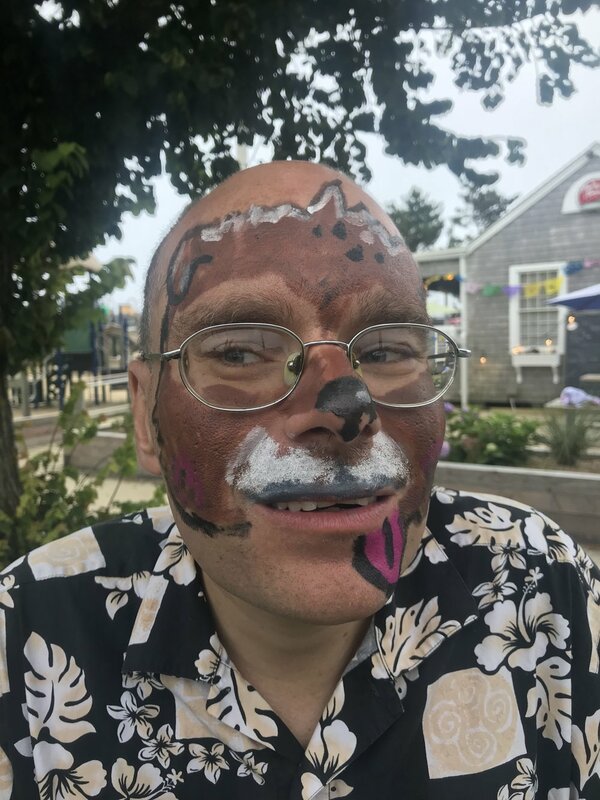 Also, we could sing a thirty second made-up Nantucket song, convince someone they are on Martha's Vineyard, take a picture with a statue and a cute dog and ask people to pronounce Tulgey Wood. We had to find the most expensive item we could. Rebecca found (and tried on) a diamond ring that cost $325,000. Maggie's team saw a statue outside an art gallery that cost $475,000, and Steve found a ring for $4,000. (You think that's expensive?!) 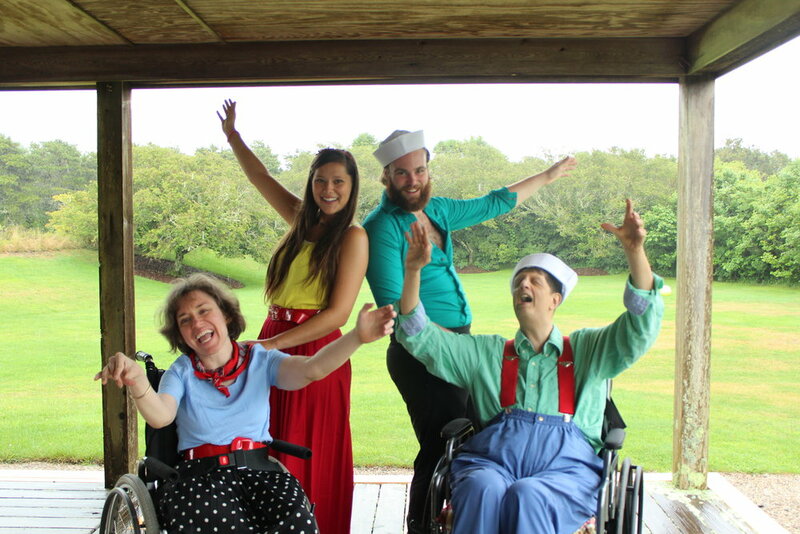 Meg's team's original song started, "There once was a man who lived on Nantucket, he had a boyfriend whose name was Steve Kutasz..."
We gave out brochures and flyers, with hopes that some of the people we met will come to our play. The scavenger hunt was really fun and everyone had memorable moments, but we haven't found out who won yet, because we are so busy with play practice. We found a restaurant in a train car! Speaking of the play, after dinner, we read through the whole play for the first time. It sounds pretty funny! A new song “Home” was introduced. 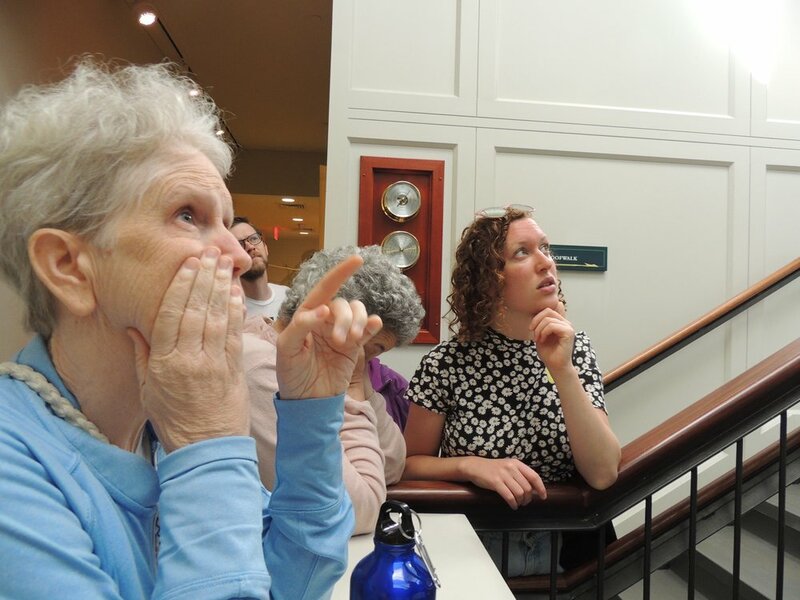 We were so happy to be invited to return to the Whaling Museum for tours with Susan Berman and Karen McNab. Some people stayed back to practice lines, prepare a picnic and do breakfast chores, but the rest of us were delighted to go through the museum. We learned that the language spoken by the Wampanoags was "Massachusett." We were told that the harpoons didn't actually hurt the whales; they feel like a bee sting, but even a bee sting is annoying, and the whales moved around a lot to get away from that feeling. We saw a big iron harpoon that was all twisted up like a corkscrew from the whale trying to get away. We visited the Maria Mitchell room. For those of you that don't know Maria Mitchell, she is famous for finding a comet which was eventually named after her. We learned that all the people on Nantucket were Quakers. If people weren't Quakers, they pretended they were, otherwise they wouldn't have jobs. They wore black and white clothing and didn't wear jewelry because they couldn't show off their wealth, even if they were rich. Maria's father was a banker well known in the town. When a Quaker official came to him to tell him to take the piano out of his house, he pointed out that he controlled all the banking in the town and if he wanted his children to learn piano, he was not going to be persuaded to stop. He kept the piano! Katie especially liked the photo booth part and seeing interesting things. 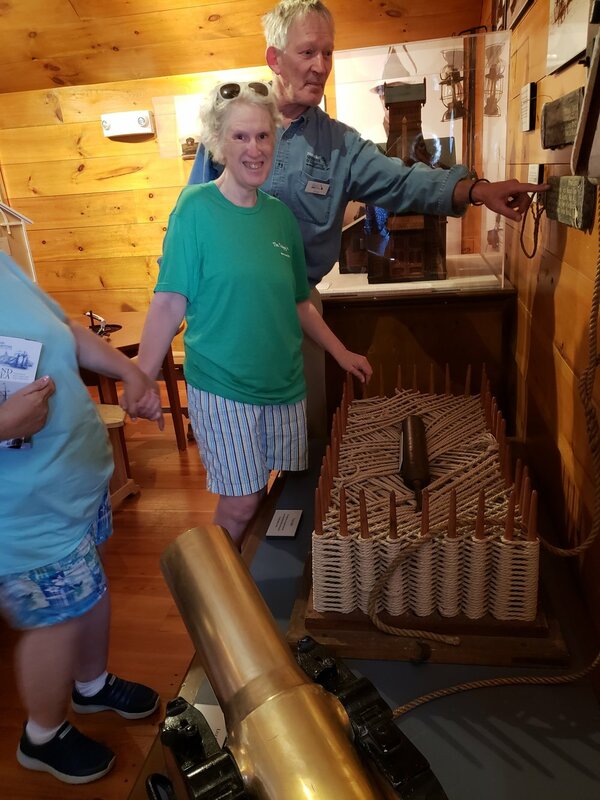 She said, "The tour itself was good as well." 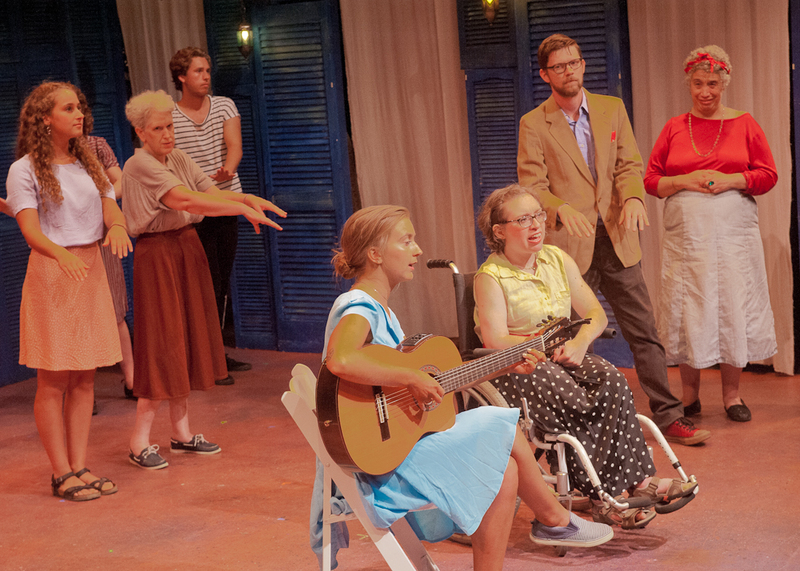 Many of us walked up the hill to Bennett Hall for play practice - our first in the theater. Mike L said we did well and that we're in good shape to learn everything we need to learn by Saturday. Many of us went back to camp to rest and have yoga (thanks, Sherri!) after play practice. A small group of motivated beach lovers went swimming. Josh told us, and showed us with his hands that Mike H dunked him under the water. Adama and Monik invite everyone in! Whoops, Josh! How'd that happen? Dinner was a lovely cookout (thanks to Francis, John O and Ann!) with our tables out on the lawn and the sound of birds and airplanes as background music. Cookout night is many people's favorite. As dark began to fall, we cleaned up and headed to the living room for another round of play practice! Meg wrote: Day 4 got off to a great start. Everyone knows the song, “Uptown Girl" pretty well by now. After working on the musical, we broke into different groups. 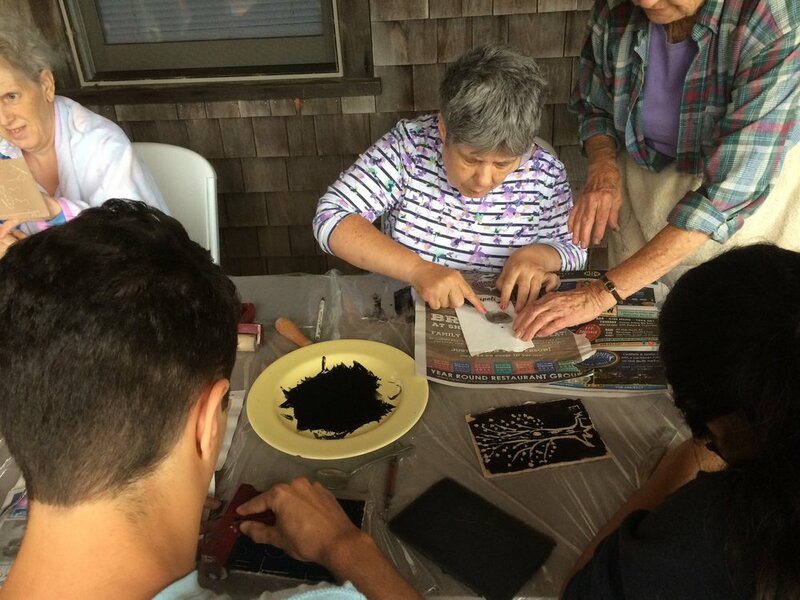 Our activities included singing, working on the play, making pottery, doing a print making project, or taking a walk. We also had a special guest in the morning. Her name is Gabriella. She loves to sing and she looked cute in her pink outfit with her stylish purple glasses! We hope she'll come back other days! Another highlight of the morning was Luke playing the drums. He’s been playing for many years and he’s incredible!! Luke said he's happy to teach anyone who would like to learn to drum. Grace rocks out on the piano! Billy rocks out on drums, too! The morning became a bit eventful because a bee colony had to be relocated from the side of the house! Meg described her experience with the bees: "What was interesting was I saw a Queen Bee that the beekeeper, Zack, captured. He’s been doing this for 6 years and takes the bees he captures to his bee farm. He said the Queen Bee produces between 1,500-2,000 eggs a day. I was surprised his suit is only made out of cotton and that he gets stung all the time and it doesn’t faze him. He’s not even afraid of becoming allergic because a person’s body can change and become allergic to something every seven years." After lunch, many people told stories about their mornings. Candy told us about making a turtle out of clay during art. She hopes "it won't get busted when she takes it home." Not everyone was around the house in the morning because some people went on boat rides with Chris Shannon. The first boating group was Ben, Ben, Billy, Jack, Kieran, and Luke. They said the boat went at a very fast speed. Jack says the seas were very good and he wants to go out again! Everyone also got a new hat from the marina. Thanks, Chris, for the boat rides and the hats!! Peter, Jamie, Ellen, Steve, Anna and Sean went out with the second boating group. Peter said, "The first part of the water was calm, so nice and relaxing. I was really enjoying myself. Then we started going faster and I got splashed a little, but I still loved it. And that's my whale of a tale." However, they had an unexpected problem that Peter didn't mention. Right when they started picking up speed, the boat stopped, suddenly. After a few moments, they restarted the boat and were going fine, and it stopped again. Finally, the captain figured out that Ellen had hit the kill switch by mistake. After he disabled it, they had a great ride! The day got even better in the afternoon when we had a dance party at Children's Beach! We also enjoyed a dinner picnic with sandwiches, popcorn, chips, and cookies. Katie said that she enjoyed the dance party because "I loved the playlist and dancing with all my friends, including Jamie!" Big shout out to Rebecca and her crew at the Hungry Minnow for extraordinary facepainting and the popcorn! After the dance party, we were all tired so we went home to watch the movie Coco. Everyone loved the movie and all the music in it. Face painting . . .
Is it Steve? Is it Sammy dog? Definitely one of the Best Camp Days Ever! In the morning, we visited the Life Saving Museum for the first time. We learned a lot there. The museum featured 700 shipwrecks that had occurred over several centuries. It was their 50th anniversary. About 200 - 300 ships used the channels near Nantucket to transport cargo. Some of the boats carried wine, coal, cotton and lumber. Surrounding Nantucket there are many dangerous shoals, and it was very challenging for the ships to avoid them, especially during winter storms, which are much worse than summer storms, it turns out. So many boats floundered on the shores and shoals that the people of Nantucket volunteered to keep watch and try to save people from boats in trouble. After many years, things got more professional, and it finally became a government job. The life savers worked long hours, sometimes days, to save the lives of people on the wrecked boats, and they saved as many people as they could, but sometimes, some people died, including rescuers and shipwrecked sailors and families. We went straight from the museum to a beach we've never visited before, Quidnet Beach. Some people went swimming. Meg found it very relaxing and pretty to sit on the beach and look out at the water. Josh and Thomas got buried in the sand from toes to necks. 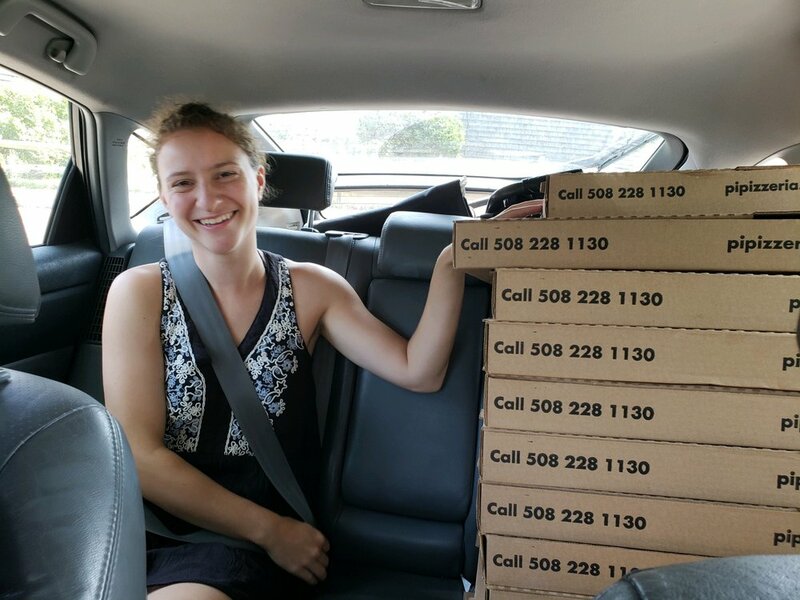 As a very special treat, we ordered pizzas for lunch! Adama, Grace, Rebecca, Peanut, Talia, Monik, and Eva went boating instead of going to the museum. They all loved the excursion and jumped off the boat and swam in the ocean. They tried to meet the group at the beach, but got very lost on the way! They still had a few minutes to enjoy the water and some pizza, however. 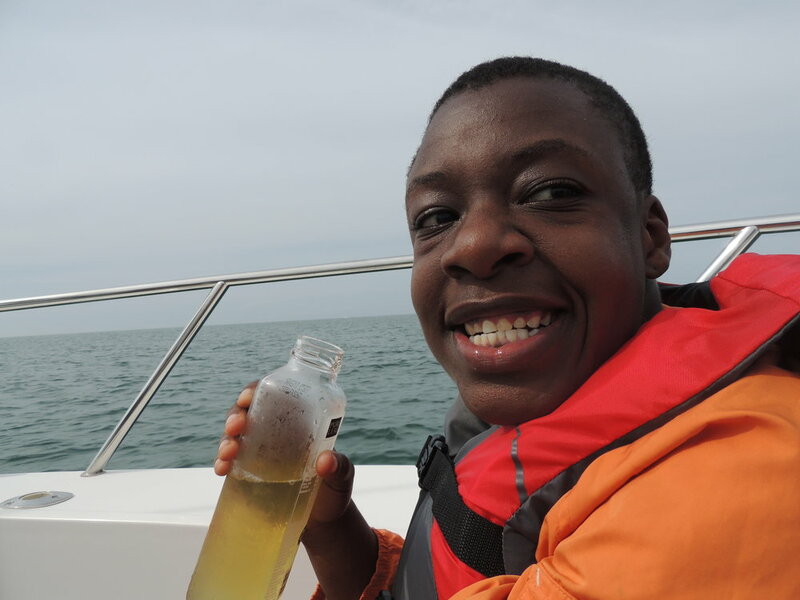 Adama loved driving the boat! Luke and Kieran are natural swimmers! Hold on, Eva and Peanut! This afternoon, we had our sing-along at Siasconset Union Chapel. Meg always looks forward to Bob Lehman and Susan Berman, with Ray Saunders, singing with us. There were too many songs to name, but Meg especially loved John Denver's "Country Roads." She also really loves a song that Susan shared, written by David Roth, "My Voice Matters." The chorus for that song is really powerful and many of us could relate to it: "My voice matters, my voice counts. Get to know what I am all about, No more labels, fears or doubts. My voice matters, my voice counts." Old and new friends joined us for a lively, enthusiastic, melodic afternoon, perfectly punctuated by Luke's tambourine playing and accompanied by Monik on piano for several selections. For the final song, we practiced "Uptown Girl." 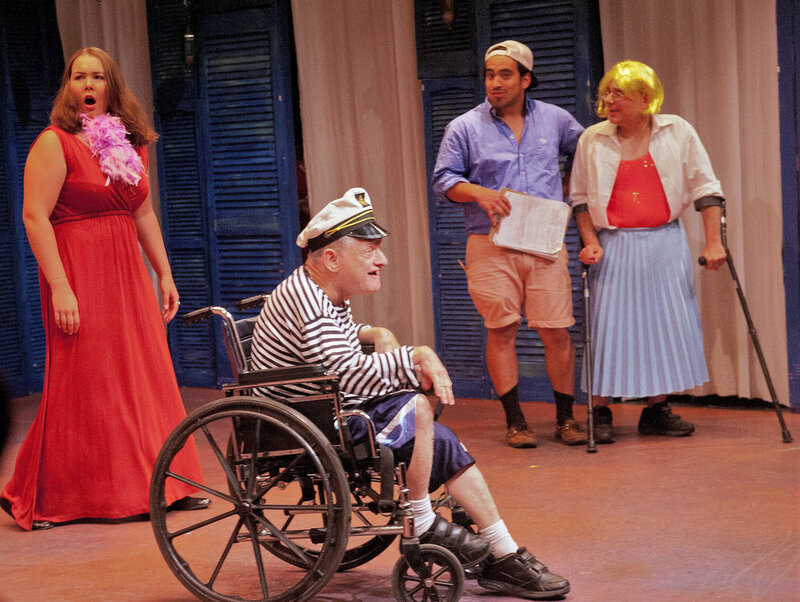 We hope lots of people will be at the play on Saturday at Bennett Hall (2pm!) to hear it in the context of "Breakfast at Tiffany's, too." 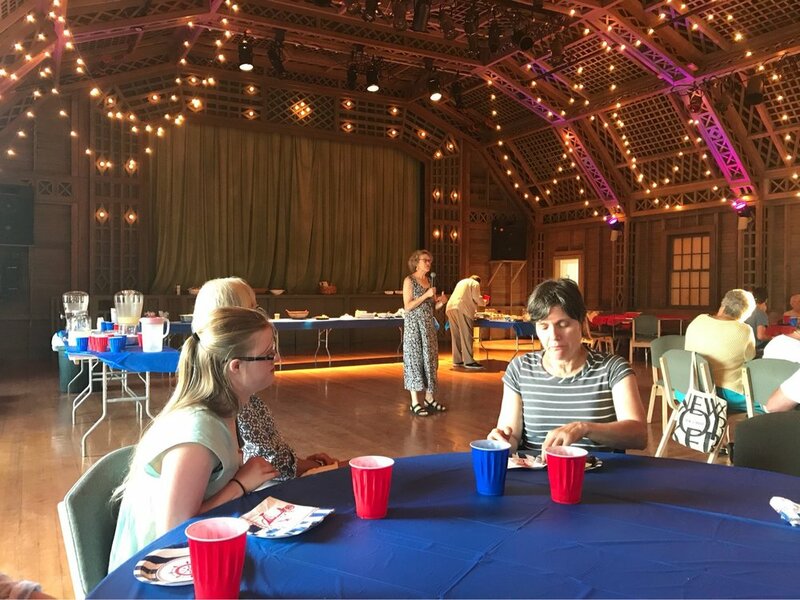 We were invited to a "picnic" after the sing-along at the Casino next door to the Chapel. A casino is a meeting place where people gather for social events - not necessarily always gambling, like most people would think. 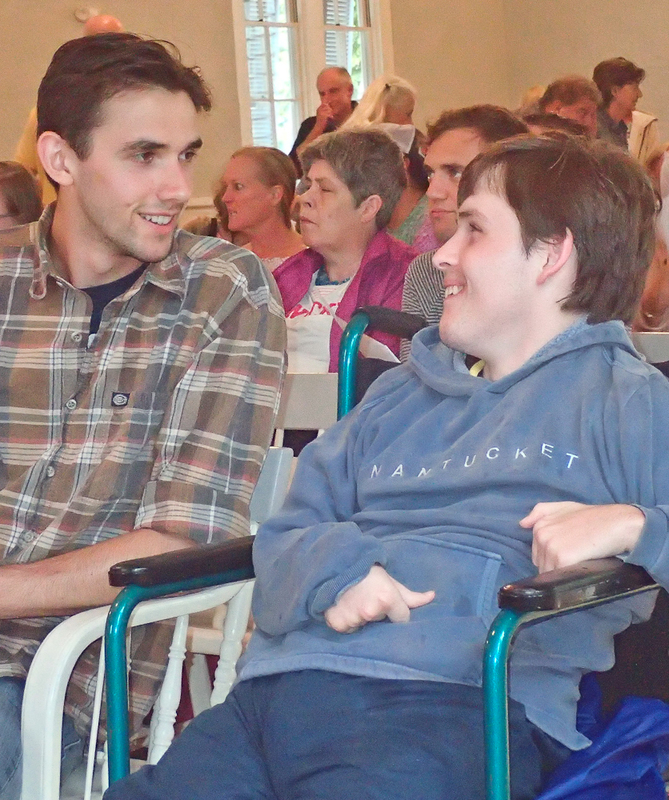 We were struck again by how nice and accepting the Siasconset Chapel Outreach group is. The food was yummy and plentiful, we greatly enjoyed the company, and we left just in time to see a bit of sunset. It was cool that when we got back from Siasconset we had another mini dance party here. We heard the Justin Timberlake song, "I've got this feeling" and "Thriller." Some people had their glo-sticks and we danced in the dark. We followed up the second dance party with a group bonfire where we talked and watched the stars. Katie said that she loved the bonfire because everyone was together and enjoying each other's company. We are all excited for more camp days and bonfire nights! 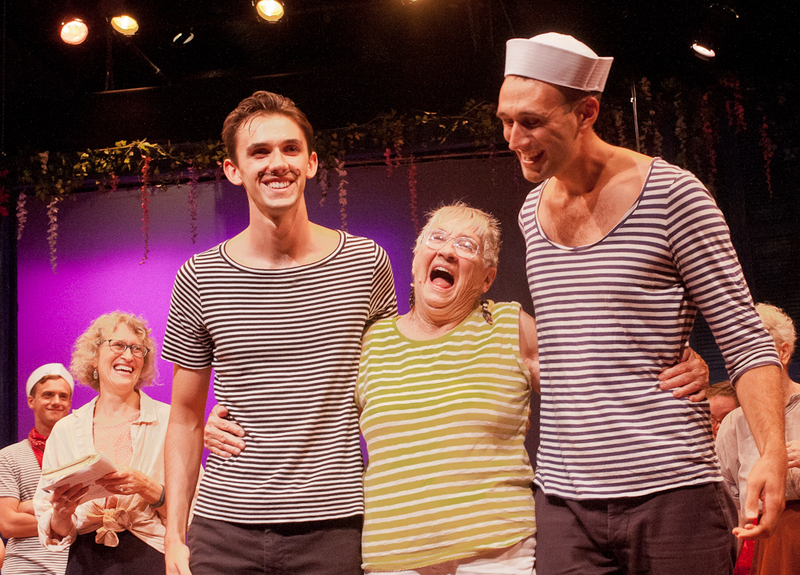 Katie, Peter, and Jamie becoming sailors! Days 1, 2 and 3! 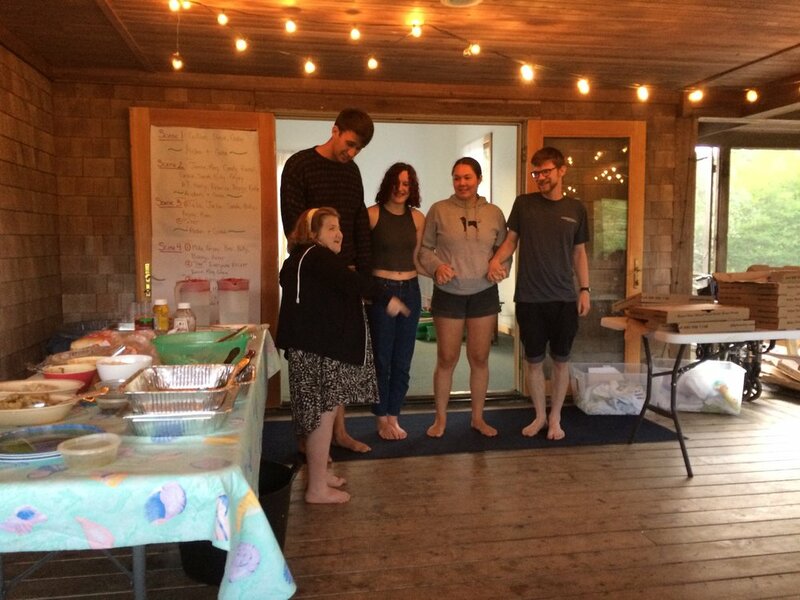 written by the blog team of Meg, Eva and Jan.
On Friday, we welcomed everyone to camp with some games, yoga, (thanks, Marjorie!) dinner, and of course stories! 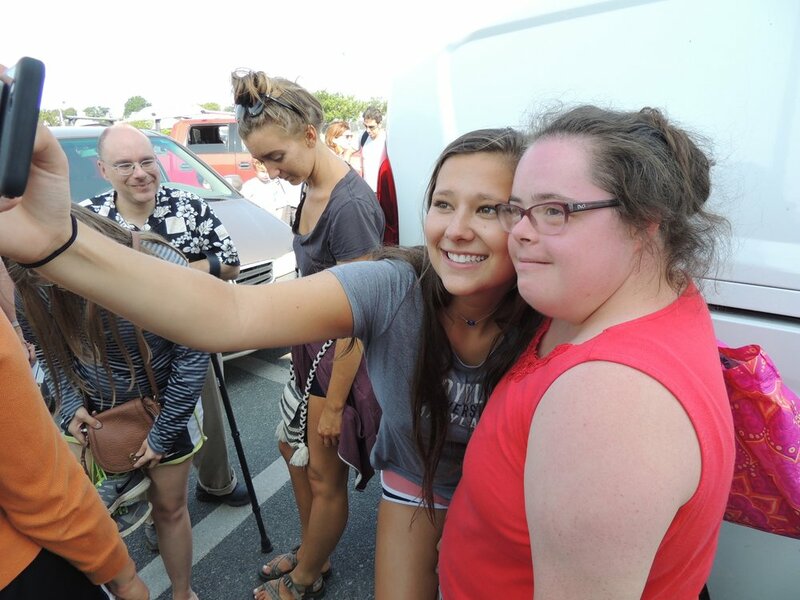 Meg writes: “It was so great to see everyone again after last year. Mike H told me he had a surprise for me when we arrived at the house. I saw a portable ramp from the porch into the house which makes it much easier getting into the house. I’m so happy and I’m sure others who use wheelchairs are too. This is the first year of having a ramp. Dinner was prepared for us in style by Kathleen, her brother Billy and their friends Blake and Barbara. We feasted on a fresh tomato salad, chicken, beans, rice and cornbread – and we really pigged out! After dinner, there were ice cream sundaes, cookies and watermelon. Maybe we’ll never need a meal again! Good times with the ladies! 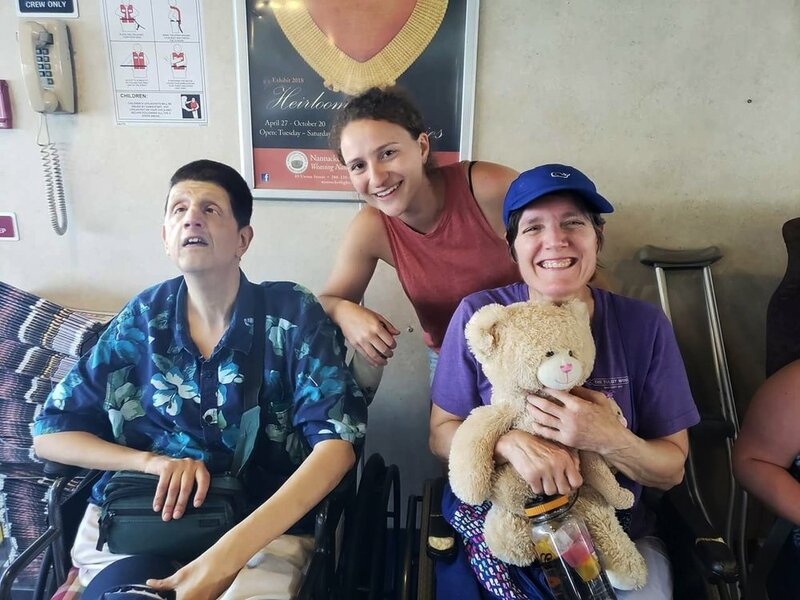 Peter, Candy, and Jamie are happy to be reunited! After dinner, we started learning songs for this year’s play. We started with “Rich Girl,” which has a great rhythm to dance to. Some of us were surprised at the language. 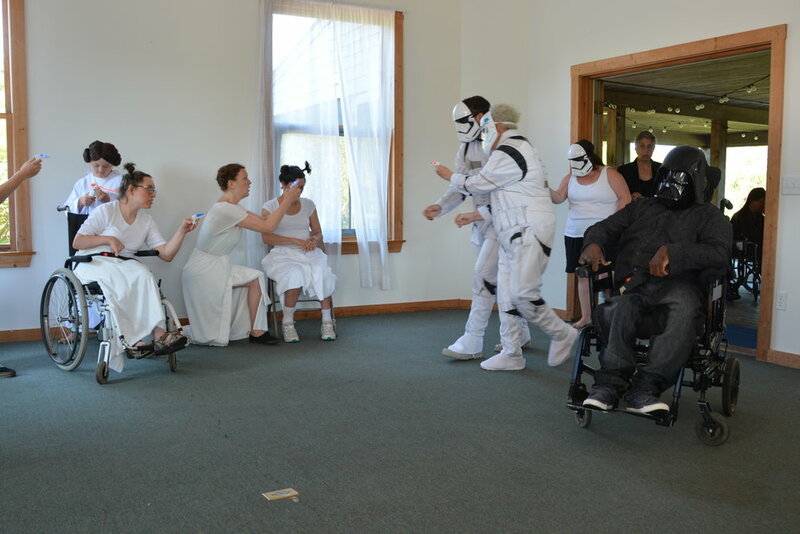 . . Everyone enjoyed singing, dancing, and bonding. We are very excited for the play next week! Saturday was our first full day at camp. It was cloudy with rain forecast and a little chill in the air. 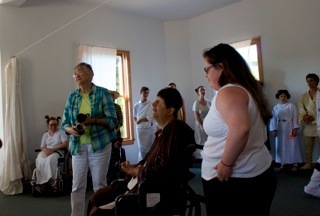 Our gentle awakening was much helped with a yoga class taught by Sally. The morning was a classic (and therefore somewhat rare) camp morning. 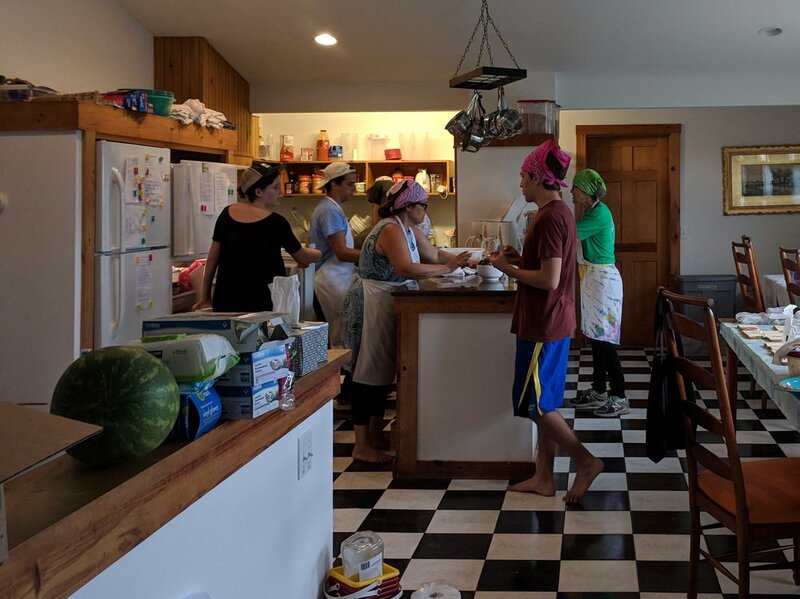 Everyone at camp is assigned a contribution, such as dishwashing, vacuuming, table clearing, organizing the shoes at the entry door and folding laundry. Mike suggested that anyone who had some free time might clean their rooms. Olivia went to her room, saw that it looked like a tornado had passed through it and said enthusiastically, “Let’s clean this place up!” And they did! Maggie made us a delicious dinner for lunch, and then we rested before heading to the Boston Pops at Jettie’s Beach. We had amazing seats for the concert. In order to get these amazing seats, we had to arrive several hours ahead of time, which turned out to be very lucky. While we were sitting and schmoozing, a reporter from the local tv network came along and interviewed Steve and Mike L! Steve did a great job talking about Tulgey Wood, and the reporter gave us a great shout out! We greatly enjoyed the Pops and the Beatle’s tribute band, Rain. As it happened, just as they began to play, down came the rain, but luckily, not for too long and not too hard. The evening ended with a bang, or many bangs actually! We happily cheered and oohed and aahed as the fireworks danced and exploded. We were all tired and went to bed as soon as we got home. Katie enjoyed a goodnight hug from Jamie! We woke up Sunday and went to four different churches. The folks who went to the Unitarian Church were lucky enough to see Elizabeth Warren. She left before they could meet her, but that was a big surprise. A lady sang "Scarborough Fair." Jack and Ben and Mike went to the Catholic Church, where a Jesuit guest priest spoke about the miracle of the loaves and fishes. Jack thought maybe this was the first time ever on Nantucket that he has gone to the Catholic Church and he loved it. 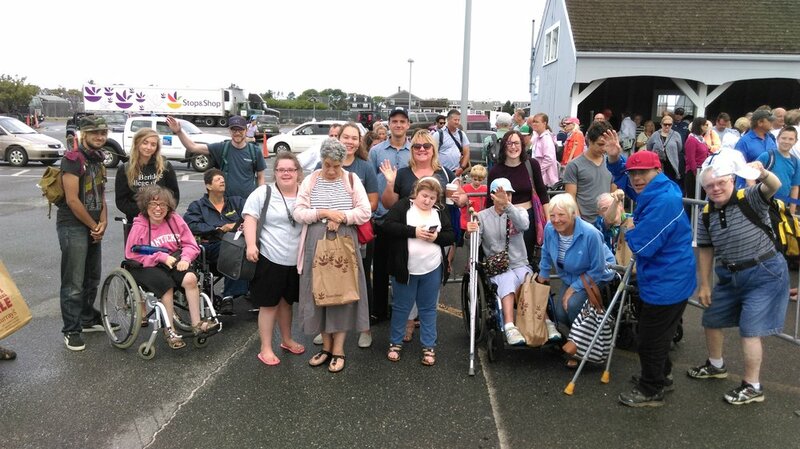 The fourth group went to the Siasconset Union Chapel, where they were warmly welcomed and had a chance to invite the whole congregation to the play on Saturday. We all enjoyed our services and are thankful to have so many friends to meet at church. After the church services, we had a picnic outside of Bennett Hall and then saw "Footloose." From the very first opening chords, we were riveted. Everyone loved all the singing and dancing, and most of us joined in from our seats. A lot of the lines were funny. Peter added his thoughts to the Town Hall meeting, saying that dancing should be legal "because it's fun." After the show, the entire cast came out to the bricks in front of the theater to chat with us. Grace and Billie had their pictures taken with different stars, and Josh got an autograph from the actor who played Wren McCormack. 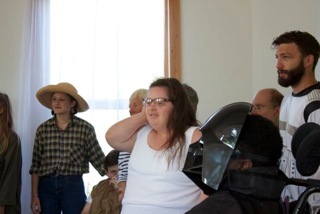 We were told by several actors that we were the best audience they've played to yet. Following dinner we brainstormed about the play. Grace and Jamie chose love interests ala Bachelorette. We worked on "Rich Girl" some more, and Katie said the music was great. It always gets Meg into a good mood! Mike lost the bet. Now he’s wet! Video for Na Na Land! Friday, August 19 How do you get to Whereowhero Lane? "Practice, Practice, Practice" of course! After yoga with Sally and a quick breakfast, a small group, including Alan, Mike, Steve, Bob, Harry and Aiden, slipped off for final boat trip while the rest of us practiced our songs for the play. 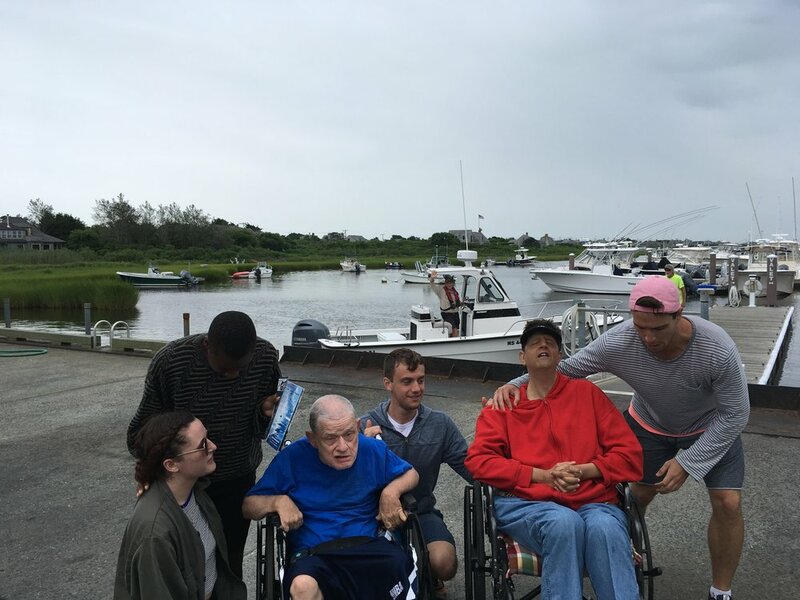 We worked on some scenes and had lunch while Rachel, Candy, Rebecca, Cameron and Talia had their final boat trip of the summer. 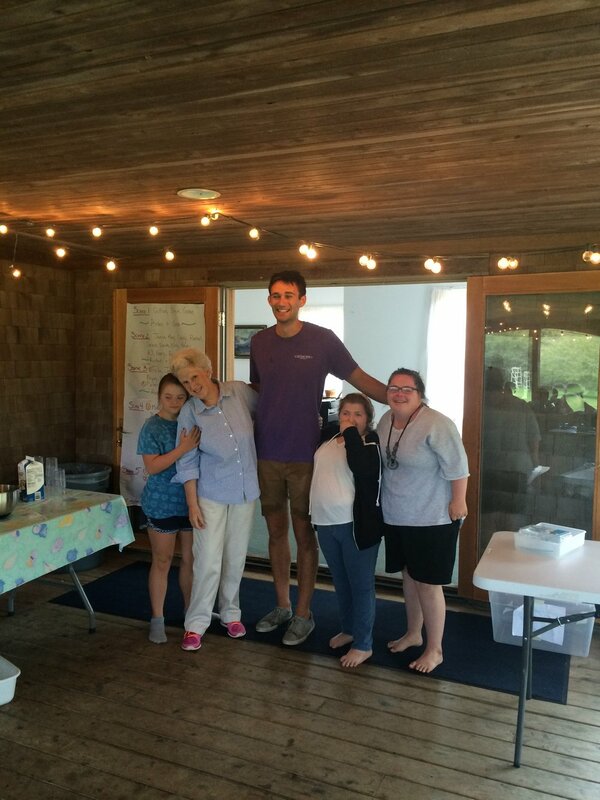 We are enormously appreciative of Chris Shannon at Madaket Marine for his generosity this summer! Thank you!!! After lunch, the boaters told us about their outing. They had a wonderful time, and the weather was beautiful: blue waters under sunny and cloudless skies. Alan and Steve spent their whole trip peppering each other with insults (in fun and friendship!) Steve threatened to put Alan in a dog leash, and Alan told him if he did that, he (Alan) would have to bite him. Steve said he was done teasing and was ready to just be nice again. He said he would like to do something to make it up to him. He asked Alan, "What would you like for breakfast? It's on you!" If Alan is lucky, he might just get coffee and a donut in bed -- and not on him. When they joked about jumping off the boat and swimming to shore, Aiden pointed out that there could be sharks and it wouldn't be safe. After lunch, we skipped rest time in order to try a run-through with all of us present. It was hard, hot work! Luckily, we did it well enough to earn a trip to the beach. The water was cool and lovely and it was even hot enough for Peter to wear his shorts (yay, Peter!) and get some sun on his legs. Just before dinner, a small group went to Don Allen Ford (the nice folks who loaned us a truck this summer!) to say hello while they were holding a special picnic. Peter and Steve were both happy to have seen old cars and a firetruck close-up, and Steve loved dancing to the live band playing there. Peggy saw her music teacher there and said she hopes to get together with her when camp is over. 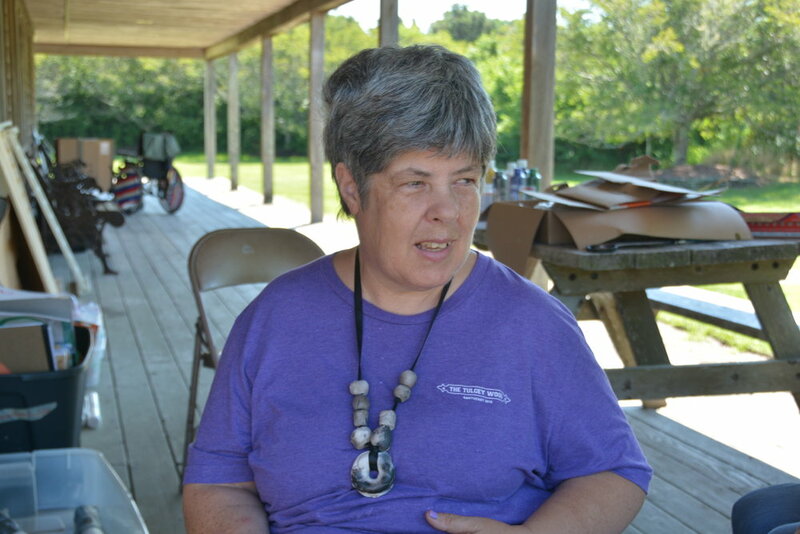 Ellen was able to show all her friends her new necklace, made with beads she made in pottery. She was excited to share the fact that the beads got cooked in our fire last night. After dinner, Will told the story of the sinking of the swan. This beloved swan (an inner-tube we've loved for about a week now) set sail for her most ambitious trip to date, with Will as captain and Mike, Gracie and Steve as crew. They paddled and kicked for a few fathoms, and then, just like on the Essex, they realized they needed to jettison someone in order to survive. Mike threw Will off the swan, so Will, acting as captain of a doomed vessel, cursed it. The swan's air slowly, but ever so surely, began to escape. Steve jumped ship, Mike followed suit, and finally, the only person clinging to the shrinking, thinning, flattening formerly grand swan was Gracie - - who gracefully swam to safety. Our dress rehearsal went off without too many hitches, so it's hi-ho and off to bed we go! 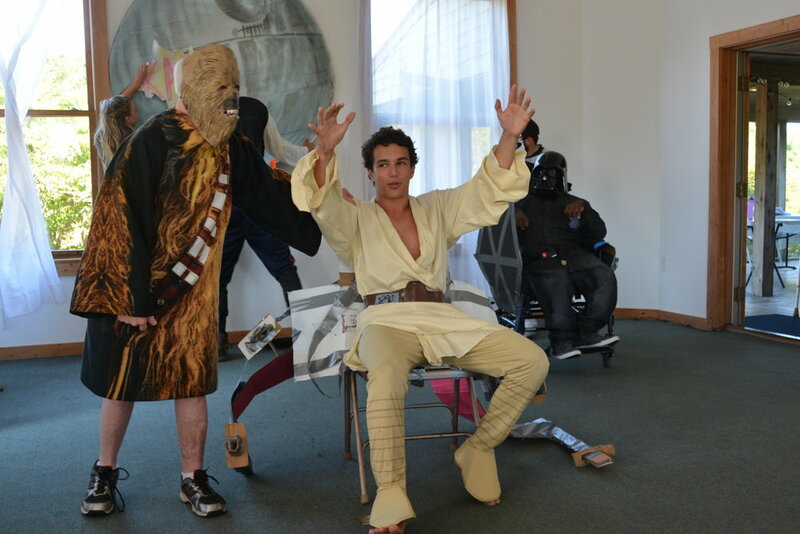 A long time ago in a galaxy far far away, (or, maybe just a few days ago!) 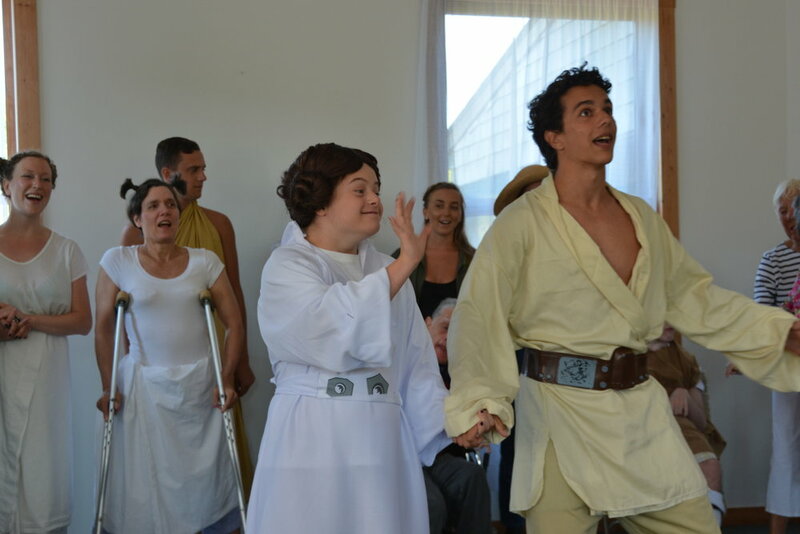 Gabe wrote us a Star Wars musical production and found a way to include songs from "Hair" and "Aladdin" and even to include a brief encounter with Mary Poppins! Thanks to Gabe for clever writing and flexible directing, thanks to Mike who kept everything moving forward, thanks to Monik who did an amazing job with the music, and really, thanks to everyone here!! 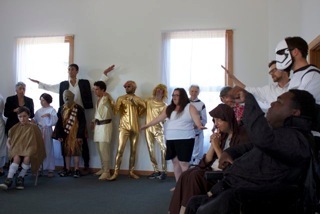 There had been plenty of room for doubt as to whether we could make it work, but because lots of people worked so hard, we learned lines and songs and had costumes, staging, props and just enough gorgeously painted scenery - - we pulled it together and put on a great play! After the play, many of our lovely audience, from near and far, stayed to see our rooms and share refreshments with us. Thanks to Sarah, Gloria and Jenny, we had tons of cheese, crackers, veggies, cookies, brownies, and small cakes. We basked in the happy feeling of accomplishment and completion for the rest of the evening. We had a cookout and re-lived moments from the show. Then, we had a truly special treat! As the twilight turned to night, with Peter officiating, Emily and Gabe got married all over again, right here on the lawn, in their full wedding paraphernalia! When it was just too dark and chilly to sit outside any longer, we went into the Great Room and watched the show on video. It really did look good! 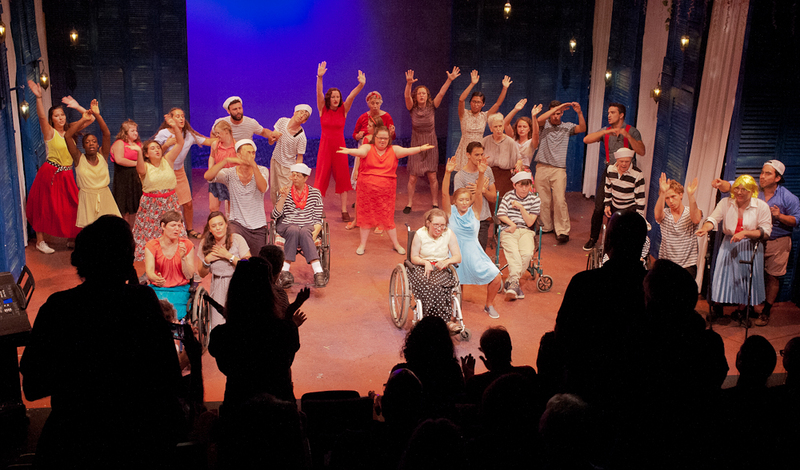 Steve said his favorite part was the standing ovation; Katie liked all of it best, but especially the dancing! We'll get a link up for you to see it for yourself just as soon as we can! 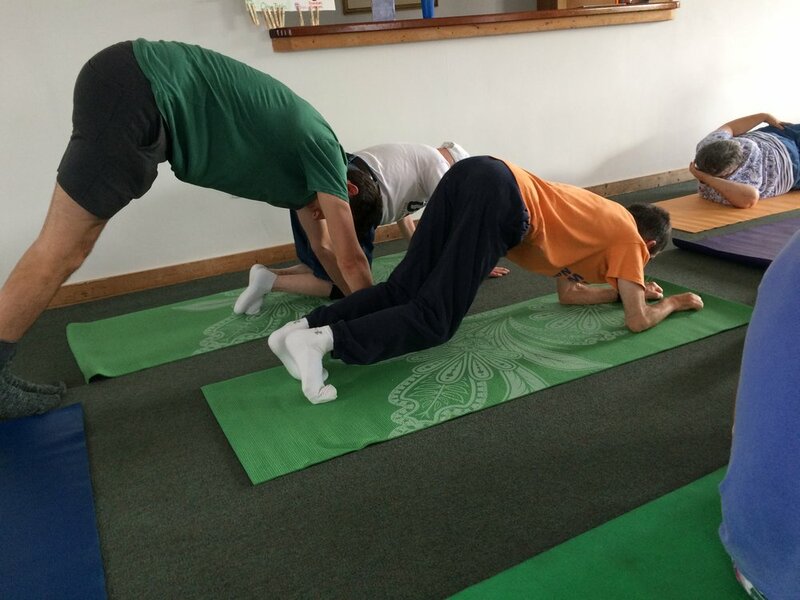 August 17 We started the day bright and early with yoga class with Sally. Quite a few of us have sore muscles, sore backs (not to mention a couple of sore throats - - yoga doesn't help those!) so we are especially grateful to all of our yoga teachers for coming here to share their practice. After breakfast, the focus was on the play. There were still a few scenes that no one had read through, and the play is in four days! Yikes! When people weren't part of a scene or working on their lines, they were happy to join Elinor for some small print-making classes. Today's lunch makers Rachel and Anjay were well helped by Audrey, who added all the cheese to the pizza bagels. After lunch, Harry did a fashion show of unclaimed laundry -- and now it's mostly claimed! Before we went to nap time, we were sad to say goodbye to Audrey and Alycia. We hope they'll stay longer next year! We had hoped to try a new beach today, but Mike checked it out and it was not the right beach for us today, so we went back to Brant Point. We had an amazing day at the beach, and Alan took equally amazing photos, which are posted below! Before dinner tonight, Grace gave the "evening reading" - she strummed a guitar and she and Jamie sang "Hair" all the way through. 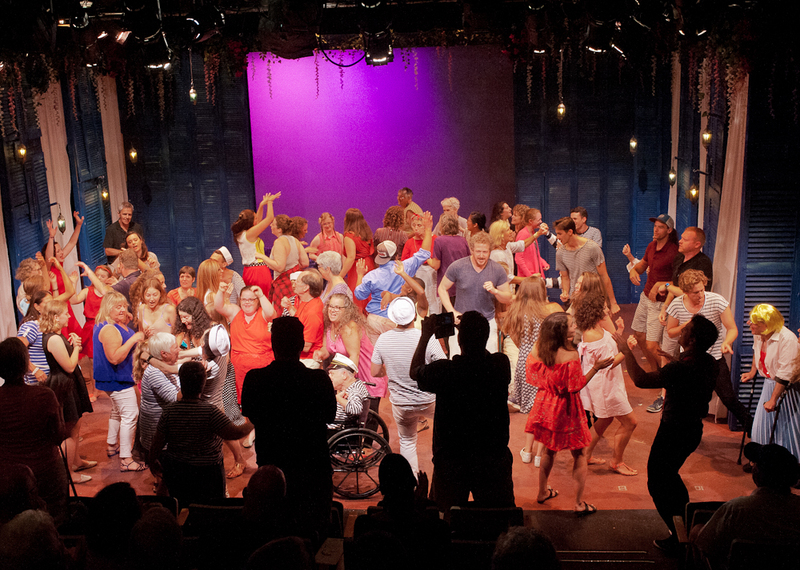 Afterwards, we used Studio Night to run through most of the parts of the play that we have practiced so far. It was quite a rough run-through, with lots of hilarity, lots of ad-libbing, especially when Aiden repeatedly zoomed around the group on stage during a scene that he wasn't expected in. 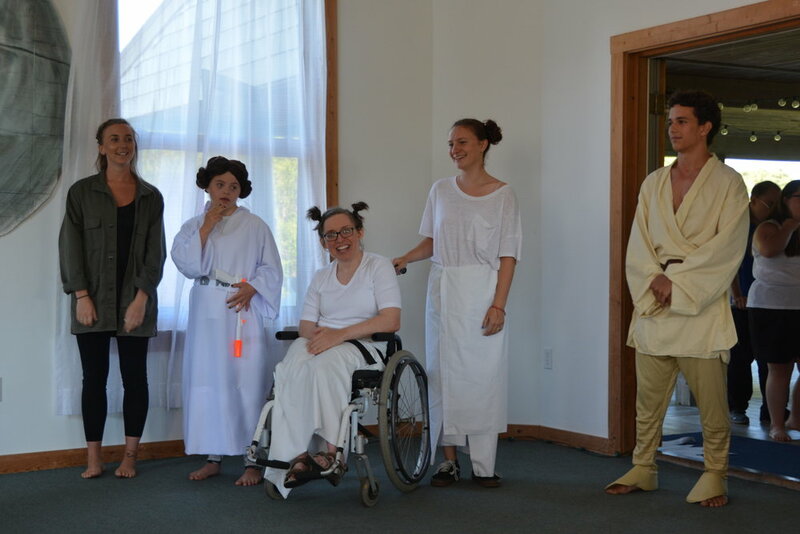 Sarah wowed us with her "boop boop boops" as R2D2; Grace, as Princess Leia had plenty of fight in her; Bob had his Chewbacca lines down pat; Katie led the dance chorus of "Dance Dance Dance" with energy; and Meg, Mike, Ben, Peter and Billy knew all their lines quite impressively. Jamie, Rebecca, Rachel, Grace, Peanut, Mike, Steve and Monik serenaded us with a Rebecca Original song, created today while they were floating in the pretzel. "I'm stuck in a tube, oh my lord, I don't want to drown, blub, blub, blub . . ."
Everyone was very busy (as always!) all morning. We learned some new songs for the play and then had play practice until lunch. After lunch and rest, most of us had a rollicking good game of kickball. There was a very complicated system of scorekeeping, which no one used, and there are no teams, so it's a whole different [kick]ball game! Lots of people kicked the ball and made it to home base! Katie ran very quickly to the bases and Gabe caught the ball with one hand (which was good, because his other hand was supporting Billy!) AJ pitched for part of the game, but said he doesn't really understand the game. He just has fun! Mike said, "One thing that makes it fun is that we're not that great at kicking, so there's lots of chances to run from base to base. Occasionally, one of us blocks the person guarding the base to make sure a runner can be declared safe there." 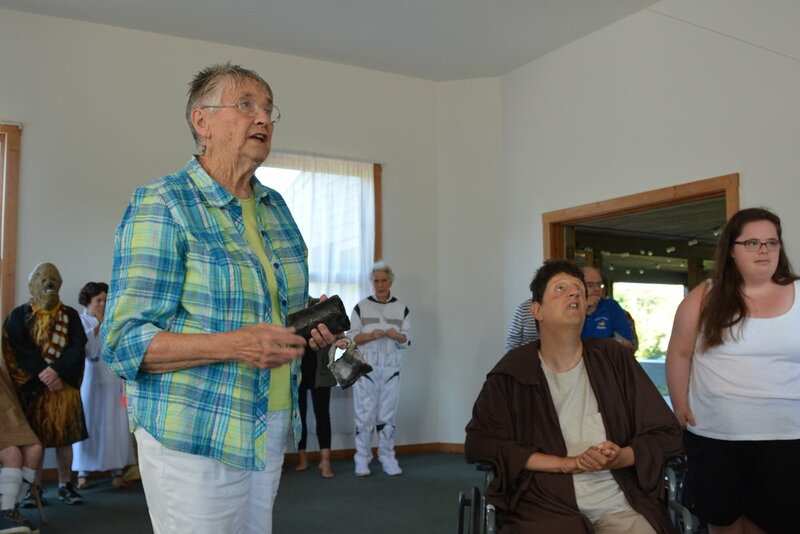 At the same time, a small group went on a special outing to see Ellen's house. Gillian, Ellen, Jackie, harry, Jackie, Rebecca, Candy and Rachel all enjoyed seeing Ellen's bedroom and the whole house, as well as the snack they shared there. Jackie said it was a very good group home. He especially liked the water with lemon slices in it. Candy said it was a big house. Rebecca reported on the snack. 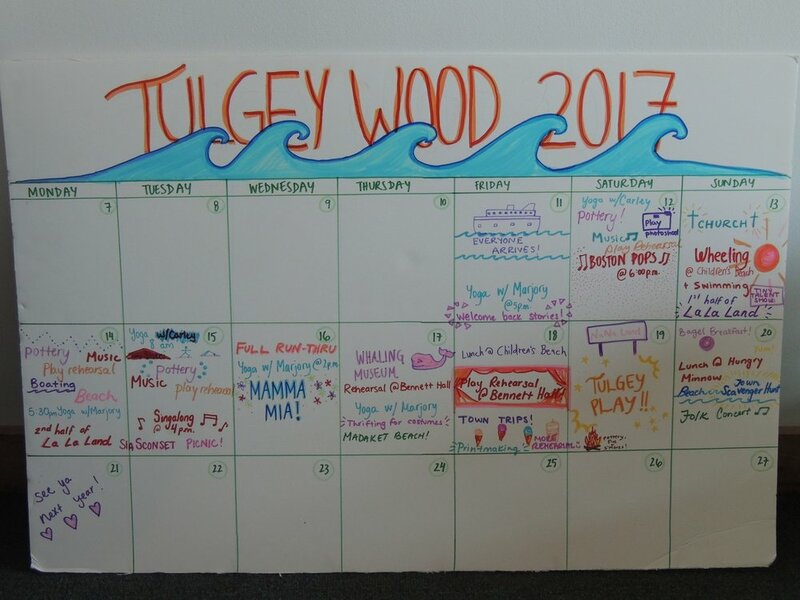 They also noticed pictures on Ellen's walls of people they recognized: the Tulgey Wood group photo from 2015, Peggy, and Emily were all part of her decor. More play practice followed. When some of us were off-stage, we got to watch Elinor firing the pots in the barbecue pit outside the house. It was amazing how quickly many of the pots were done. The temperature of the fire raised to 1100 degrees F within forty five minutes, and by applying some different metals and materials such as lemon skin and mango peels, different colors and textures were brought out in the pots. They're spectacular -- I think there will be some pictures of pots in the next blog. Yoga with Marjory (Thank you, Marjory!) preceded dinner, and then we roasted marshmallows for s'mores on top of the pots that were being fired for longer. Aiden told us a new long story about the adventures of a hat. He is a master storyteller, employing different voices and gestures to illustrate as he talks. Peter said, "He's a really good storyteller!" We ran through the whole play before bedtime. We had a good time - - and, we have a lot to pull together in the next couple of days. Going to bed, Sarah asked if she could go up on Mike's back, just like Candy goes up on Rachel's back. Mike suggested they just hold hands, but the next thing I saw was Mike sitting down on the bottom step while Sarah climbed happily onto his back. On the way upstairs, Peggy noticed a cricket on the steps. Aiden took it outside safe and sound. Some people went straight to bed and some others took some time to write a note to send in Aurora's suitcase - - she's leaving for her big trip tomorrow! Monday, August 15 - CONCERT DAY Today was pretty much all about the concert, from morning 'till night. At breakfast, someone mentioned that it was hard to remember the words to our new concert song, "I have a hat." Mike promptly sang a beautiful solo of the whole song, including the gestures and actions that accompany it! A singing prize to Mike! 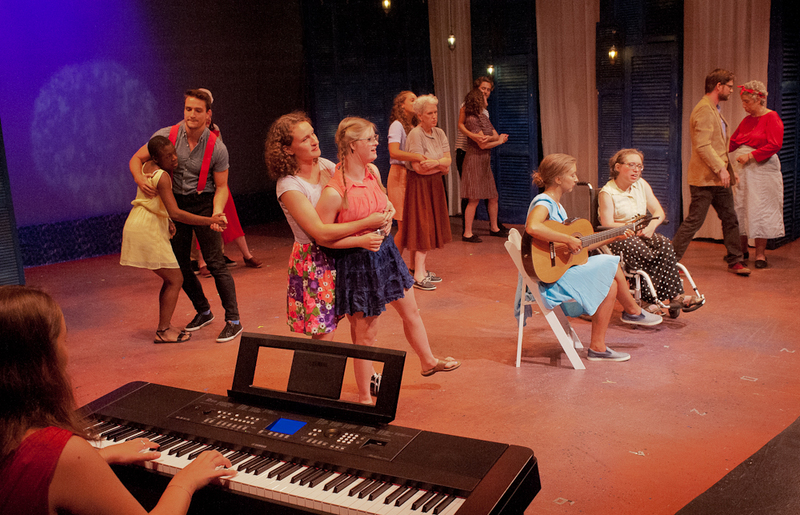 We rehearsed at camp and then at church, practicing our songs and our staging with both Bob Lehman and David Crohan. Candy said the rehearsal in the church was good. Rebecca felt otherwise, as her head had been in an unfortunately close encounter with a very heavy lamp. Peter felt the morning was perfect and was quite pleased that he remembered the words to his solo. After lunch, we had a long rest and plenty of time to beautify for the concert. The men gathered on the side porch for a shaving fest and the women gathered at a table to apply nail polish. An enormous thank you for dinner to Maria at Pi Pizzeria! We feasted on delicious eggplant parmesan, baked ziti and salad. Such a treat - - and she donated the whole shebang! Thank you, Maria- from all of us, and especially from the cook who didn't have to cook! After all the rehearsals and preparation, we had a great time at the concert! It was well-attended and a lot of fun! The church didn't start to fill up until a few minutes before seven, so it was a great relief to see so many friends arrive. David played a Broadway medley and then played some Brahms, and then Bob joined him on several more Broadway songs. And then, it was our turn. There were a couple of parts that could have gone better, but overall, it went really well and the audience gave us a standing ovation! Many thanks our friends at the to the Unitarian Meeting House, to the audience and to Bob and David for such a special evening. This morning was pretty crazy! We were delightfully surprised when Sherry came to teach yoga, but since it had been left off the calendar by mistake, we weren't ready. Mike rang the bell to wake everyone up. Then he split the group into several parts. Ellen, Ben, Cameron, Talia, Katie, Monik, Rachel, Bob, Sarah, Candy, Rebecca and Jan went to yoga in the great room, and Anjay, Billy, Jamie, Mike, Gabe, AJ, Gracie, Peggy, Peter and Steve ate breakfast quickly and jumped into vans to go to the Whaling Museum. Jackie and Harry had awakened before everyone else and grabbed coffee and yogurt parfaits and took them to the beach to enjoy the morning vibe there. Candy, Rebecca, Rachel, Bob and Talia went to the Fog Island Cafe for breakfast to celebrate winning their room inspections. They reported that the food was very good (Candy recommends the cheese omelet) and the people at the cafe were very welcoming. After their breakfast, they did a bit of shopping. They found a consignment store where Rebecca scored some bright and glittery rings, which go well with her other fun jewelry. 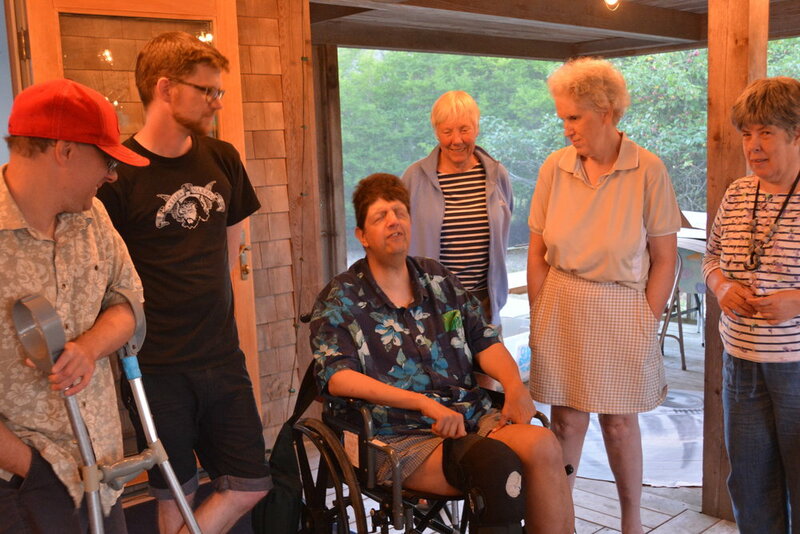 David needed time to practice for his upcoming Martha's Vineyard concert so we got to have a home concert for the group that remained here. He played the Brahms and Beethoven accompanied by a tape of the cello part. The music that filled the great room was worthy of a concert hall - - hardly a practice as we know it! The group that went to the museum got even more out of this second visit than they did last week. They handled the artifacts again, including some whale's teeth with scrimshaw, some baline and some plush toy representations of squid and plankton. 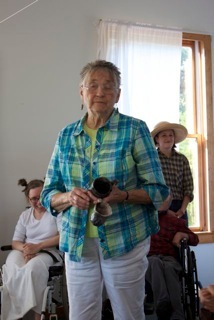 Peggy was pleased that she could hand the artifacts on to the next person very carefully. Peter loved smelling the samples and sitting in the rowboat. He also loved going to the roof. After lunch and a rest, we crossed our fingers that the predicted storm wouldn't hit Nantucket after all, because we were ready to swim. We went to the ocean beach for the first time this year. The storm stayed away and the water was challenging but wonderful! Candy said, "In the water, I had fun in the waves and I didn't want to get out." AJ said, "Today we went to the beach and I had a great time in the water. Mike kept asking me if I wanted to ride a wave. I thought sure, that will be so easy. Next thing I know, I'm under water." Mike added, "We kind of rode the waves a little and we got pushed forward and then it washed all over AJ's face." AJ wrapped up with, "I got upset, and then I was laughing. There's always a first time for everything, even an almost drowning." Rebecca said, "We went in the water but we couldn't make it because there were a lot of waves. I got knocked over, believe it or not." Rachel added, "Then the water took my flip-flops off your feet, and a nice person on the beach rescued them. Rebecca did great and she never let go of the pretzel tube." Peanut and Monik were bouncing up and down in the waves, but when they tried to get out, Peanut was running and the wave hit her. 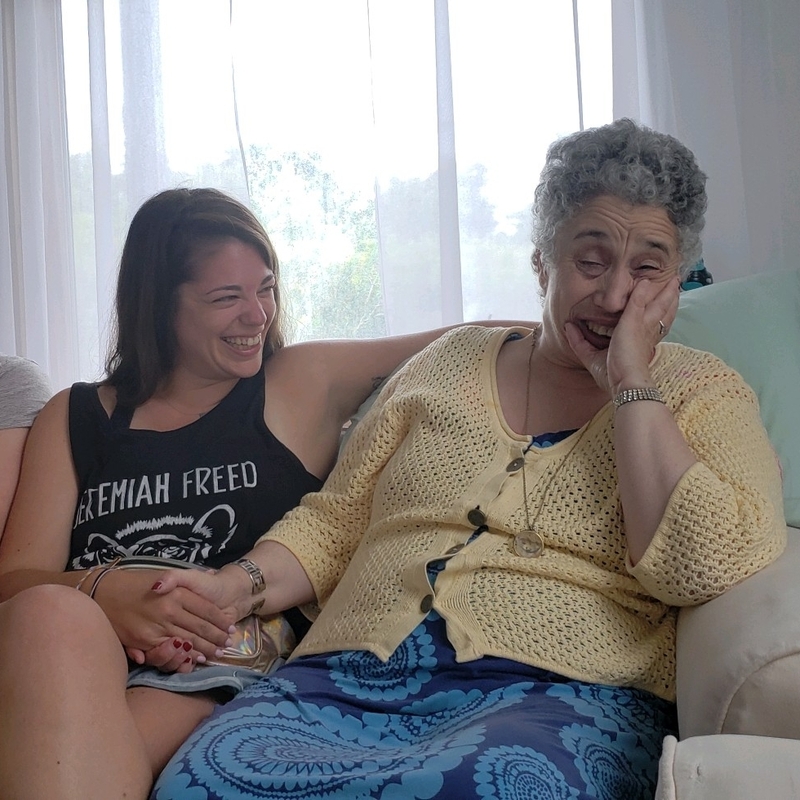 She said she laughed so hard she started to miss her mum. Grace also got hit by a wave and it caught her in the face and filled her mouth with water. Meg said, "I thought I'd just watch everyone and that was fun, but then Rachel and Talia came over and encouraged me to go in. It's almost like we went surfing today, so if we don't end up going surfing, it's okay. 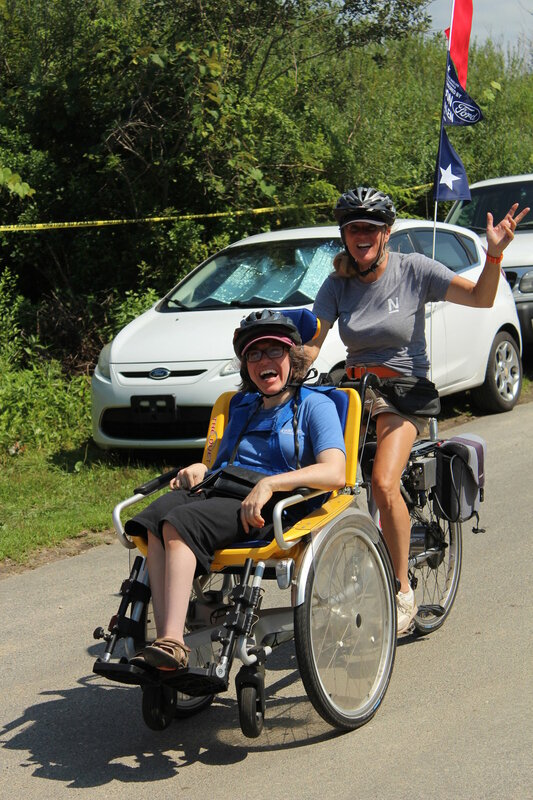 Sometimes you have to push me to do things, but I'm glad I went in - it was totally awesome!" Jackie stayed home from the beach to rest up and try to get over his cold quickly. 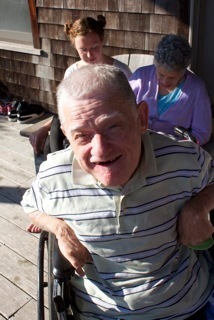 He relaxed and watched Catholic TV and then called Allison at Chilmark Chocolates and had a good chat. He hopes to go to the Vineyard in October to see Mary Beth and Allison. Peggy and Jamie also stayed home and had a restful afternoon. Perhaps they can nip the inevitable camp cold in the bud early. Tonight at dinner we welcomed Aiden, Alycia and Audrey. Alycia and Jack's joint recitation of "The Jabberwocky" as an evening reading would have made Hellcat proud. Aiden acted out and dramatically told a long story about Curious George. Lots of people told stories, which brought us straight to an early bedtime because tomorrow we have an early yoga class. Saturday, August 13 Today is the almost the halfway mark for us at camp this year. Here's how our calendar looks so far - - we fill in the days as we go . . .
Kim arrived last night and became Ellen's roommate for the weekend - although we already wish she could stay longer. Ellen, a light sleeper, awoke and dressed early when Kim got up. Kim is never one to waste any opportunity to get to know someone and see if she can help them communicate better, so she and Ellen grabbed coffees in the kitchen and sat down with Kim's Minspeak tablet. Ellen had a lot to say, and the Minspeak was useful, but not perfect. After breakfast, Kim made Ellen a pacing board, a low-tech way to help us all slow down as we speak with Ellen so that what we say is more comprehensible, and to give Ellen a chance to be clear in her response. We are going to be in such good shape for the concert! (Is it bad luck to say that?) We spent the morning doing pottery and working on the play, but we also squeezed in several music practices, two (two!) with Bob Lehman, our wonderful singing Nantucket friend who will be featured with David Crohan on Monday at the concert. We also had time to see and hear about camp so far as reported on this blog! Rachel read the whole blog to everyone who had some free time. Most people hadn't seen it yet, but now maybe there will be more authors to help it happen. While working on a scene for the play, (Warning: possible spoiler alert!) Meg, Candy and Rachel had to practice dying. Almost everyone has really been getting into pottery! We only can work on new things for another couple of days and then it's time to get them fired. We were sad to say good-bye to Lily and Mady today, and excited to say hello to Cameron! We had hoped Mady would be able to stay almost until the end, but her knee had other plans. Get better soon, Mady, and come back next year! We knew Lily only had a one week vacation, but we miss her, too! Hopefully, she can come back next year, too! She wrote a sweet letter to Billy to say goodbye. Because we were invited to go to the Boston Pops concert (The Event of the Summer on Nantucket!) we rearranged our day and had dinner in the afternoon and brought sandwiches to the beach in the evening. When Mike said there was time for a long rest and a shower following our afternoon dinner, we cheered. We squeezed in our second practice with Bob Lehman and piled into four vehicles to go to the Pops. The Pops concert was, according to everyone who offered a review, "Spectacular!" "Wonderful!" and "Awesome!" There were something like 6000 people there, so it's like being surrounded by lots of parties, and there was lots to look at. Our seats were close to the stage, so we could see and hear everything really well. Sarah took a few people with her to go see where her mum was sitting, which was right on the high tide mark on the beach, with a little water lapping around the legs of her beach chair. Gillian remarked that it was really fun to be a part of this scene. Candy said it was really fun to sing along. Peggy and Candy knew the words to almost all of the songs. We had hoped/planned to go surfing this morning, but we got a call late last night saying that the waves would be too rough and we have to postpone it until a safer time. Instead, we had a more leisurely breakfast and went to church. At lunch, Grace spread a rumor to a few people that she and Mike were getting married. Mike asked Grace if she knew that Rachel is his girlfriend. Grace said, "That's okay. He can have two!" Hmmm. 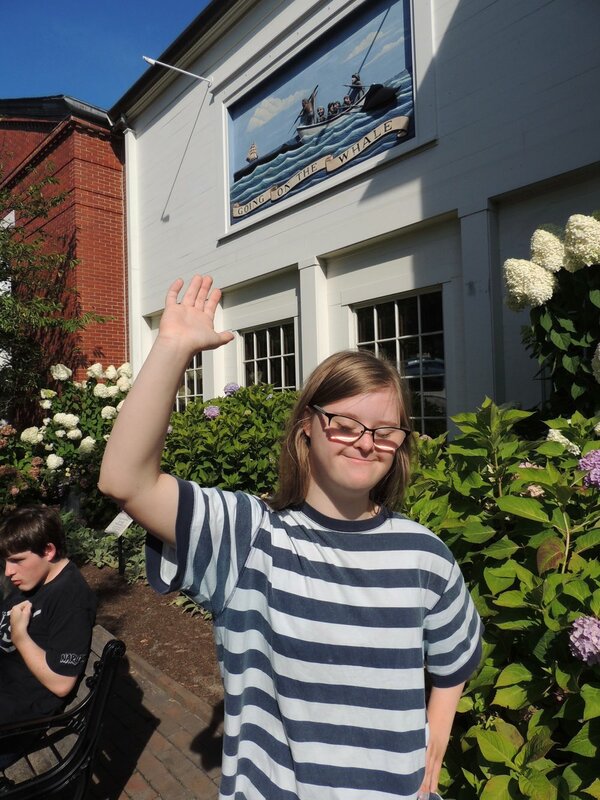 When lunch was over, Sarah made the announcement to tell us about the afternoon: "Hey guys! Listen! Today we're going to the beach. Okay? So, first we're going to swim. Okay?" It was more than just okay. Today was beastly hot and even more humid and getting to the beach was a necessity! Everyone had a great time at the beach, and almost everyone spent the whole time in the water. 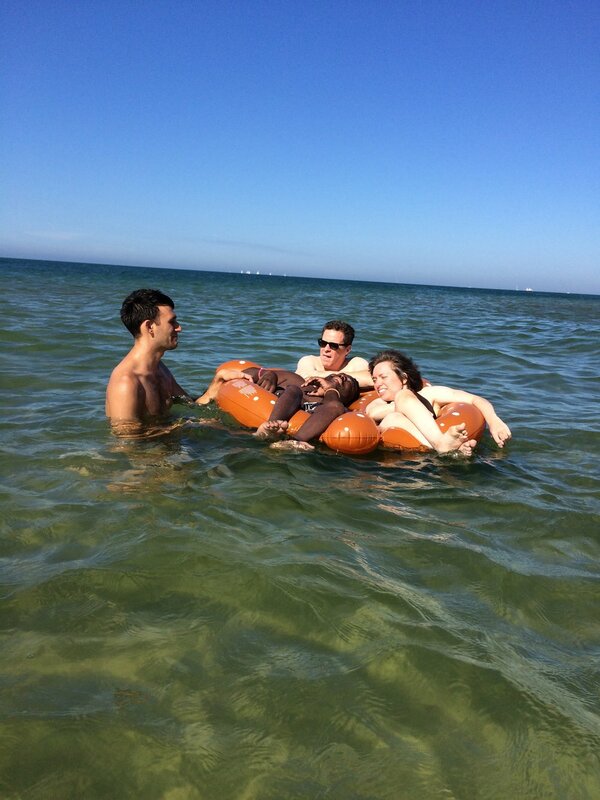 The pretzel was the popular water toy today; it was constantly in use by at least three people. We went to the Water Tower beach, which is farther from town than the Lighthouse beach or Children's beach and much harder to get to because there's a big, deep, sandy dune to walk up and down in order to reach the beach. Steve did an amazing job walking all the way there without anyone helping him, and then, after swimming, walking all the way back to the van. He said he was good and tired by the end of that! 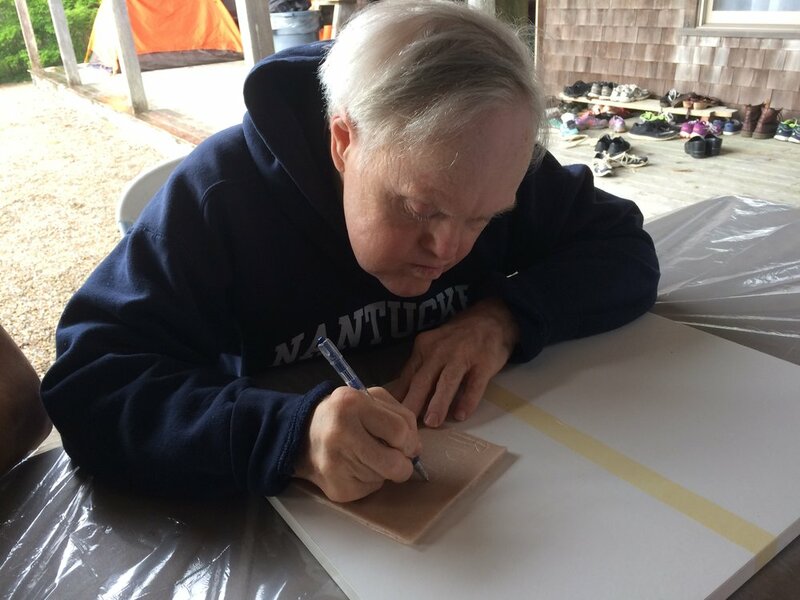 After the beach, there was a practice with Bob Lehman and David Crohan, the talented pianist and long-time friend of camp who is the main ticket on tomorrow's concert. It was a little bit of a rough practice, but Billy said it got better after some trouble spots got worked out. AJ said he loves the community here, and is so happy that he gets to come back each year. More tomorrow. On the way to return a laundry basket to the suite, I overheard a long, gloating laugh coming from a nearby bedroom. I peeked in here was the scene. Billy was sitting in a chair and gleefully gloatingly giggling. Anjay was sitting on the floor, packing up the Connect-4 game. Anjay said that Billy had just beat him 5x in a row (5 times!) and therefore his self-esteem would be taking a vacation day. Billy did admit that at Zeno Mountain Farm Ski Camp, Robin beat him in the championship - - so he's not completely unbeatable. Just hard to beat! Maybe the Collopy Cup is moving slowly because a good number of people aren't ready to send their self-esteems on a vacation. While waiting for her hair to dry so she could go to bed, Meg said when she first gets here, she gets kind of depressed because she's used to doing everything for herself, and here, there's no grab bar in the shower or by the toilet, so people have to help her do things she usually does independently and it is upsetting to rely on others. But then, she realizes that this is an unusually accessible inaccessible place. 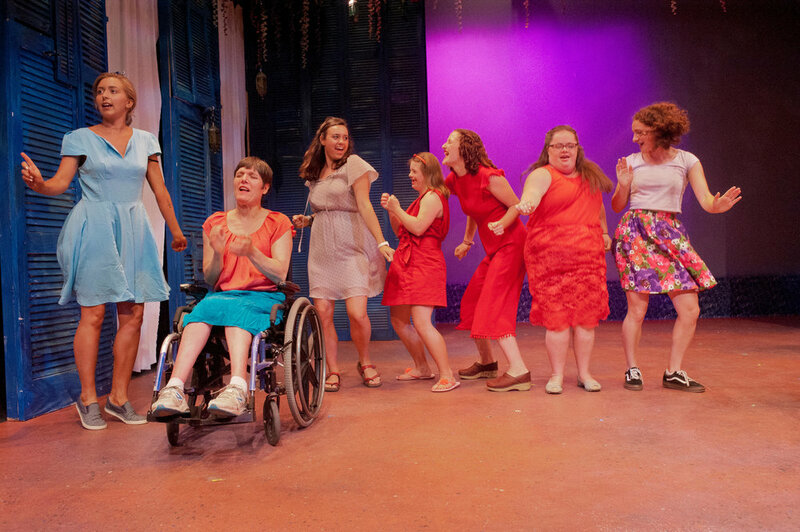 The mates make it accessible because they're so helpful. She likes that everyone here comes out of the goodness of their heart. She said, "I come from a background where my parents have always pushed me to be as independent as possible. I don't like to feel like a burden on people. I tend to be hard on myself, so I'm having to make some adjustments, which can be hard. I love the swimming and the singing and all the activities, really . But mostly it's the friendships that I really enjoy. This camp is so much fun that I look forward to it all year long. It is so wonderful here that I wish my life at home were like this!" Me, too! Note: Maddy has been doing an amazing job with our pictures, but her knee has kept her in the doctor's office for basically all of the past two days. She's doing well on crutches, but we're limping through adding pictures and hopefully captions little by little - - sorry! After breakfast, we had an update on the Callopy Cup: We’ve played exactly . . . 0 matches in the tourney so far! Today we’ll try to get started for real - - later. Meanwhile, we spent a great morning in music class and then doing pottery and working on the play. “Hair” sounds much better already (“Oh, say can you see my eyes, if you can then my hair’s too short!”), but some of the lyrics are pretty tricky to sing quickly. After lunch, we went straight to the beach – no rest – and almost everyone spent the entire time in the water. We’ve heard it’s dreadfully hot everywhere, and here it was far better, but it still felt much better to be in the water than in the air. Sarah was especially pleased with the fact that she had pushed Talia in the water. Rebecca had a great time floating in a big tube. Suddenly, Harry appeared next to her in a giant inflated pretzel and a giant inflated swan! (Harry says, “Next time give me some mustard for the pretzel, Rebecca!”) Thanks for the new water toys, Harry. Peter was willing to wear his bathing suit today. His plan was to put his toes into the water. 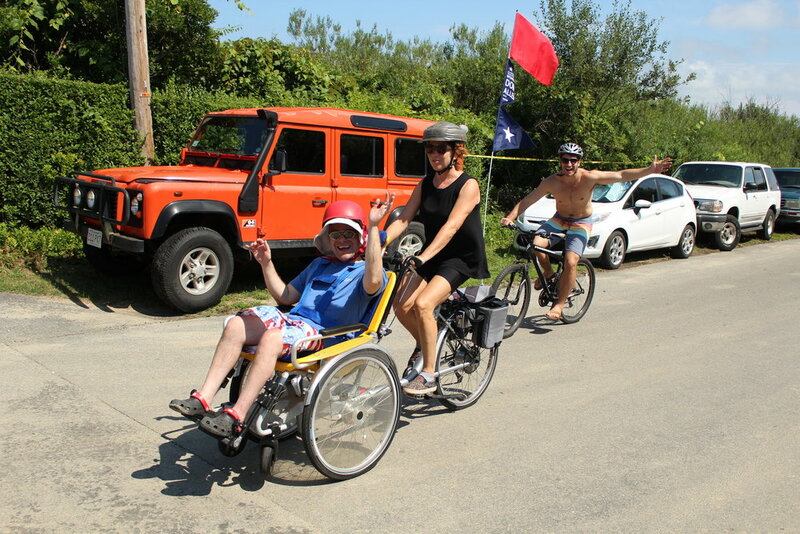 When he ended up being the first person at camp ever to flip over a beach wheelchair (picture something with the most enormous inflated wheels ever!) he also ended up taking his first swim of the summer. He was excited to report that even though it was unplanned, he loved being in the water. Mady spent her day at the doctor’s office - - not so fun, and, though she’s being an amazing sport, her knee still hurts a ton. Meg spent her day at camp, resting her knee (which also got bumped hard yesterday) and listening to Gillian read “In the Heart of the Sea.” They report it to be quite a good book, once you start getting into it. Meg found a poem in the book to read to us after dinner. By coincidence, one of our guests at dinner, Susan from the Nantucket Whaling Museum, had turned that same poem into a song, which she sang to us! Peter had to go to the doctor today to get ear medicine, and then Mady had to go back to the doctor, so Harry spent his whole morning driving to and hanging out at doctor’s offices. 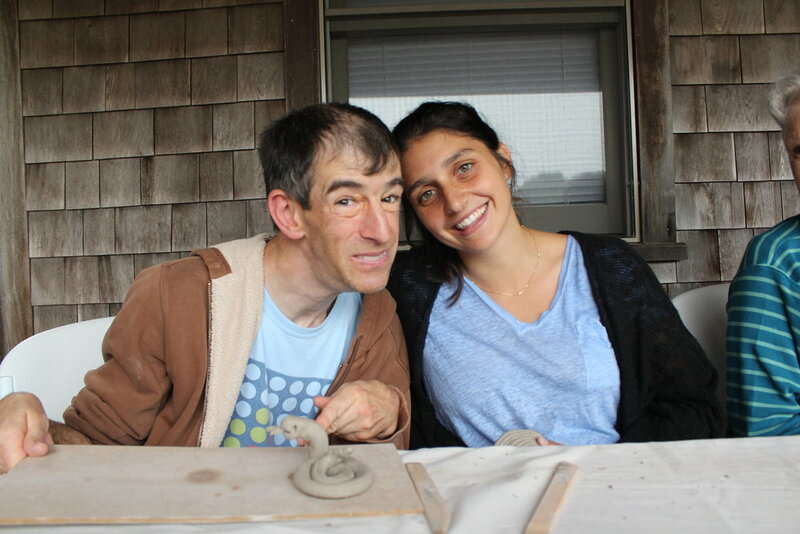 Meanwhile, after the rest of us ate breakfast, some of us went out on a boat trip with Chris Shannon of Madaket, some of us had pottery class and some of us worked on the play. A few of us skipped off to see our neighbor Jack’s electric vehicle, which was eerily silent, even when it’s turned on. His house is fully solar powered, so it’s fitting that his car is, too! Shower news: Ellen got a prize for doing such a great job taking a shower and rinsing her hair super well, and Peter was pleased to use the shower chair for the first time this year. In the afternoon, after rest period, we played a very lively game of kickball. Some of us needed some reminders about the rules (What do you mean, go out in the field?) and others of us kept running bases even after we were declared “out”, so, of course, it was a great game! Bob got to see what it’s like to have a ball slam into his head, but he and the ball-kicker had a good talk about it and hugged, so all’s well that ends well. Steve made a heroic reach for the ball with his crutches extended over his head - - and then slowly fell straight backward. Unfazed, he got up quickly after and continued to play. We had more music practice time before dinner. AJ hit his harmony line for “Seasons of Love” right on the mark. The long-held word “love” is beginning to sound sweeter, too. Just before dinner, someone new came to join us. His name is Anjay and he’s known Sarah since he was seven. 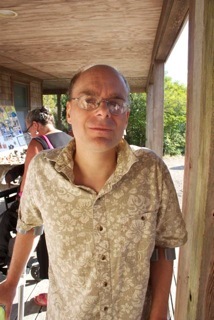 We are immensely delighted to welcome him, as we do need some extra helping hands and ready story-tellers. Our old friend Kim arrived just after dinner. She’ll spend the weekend here and hopes to get lots of time working with Jack and Billy on Minspeak. 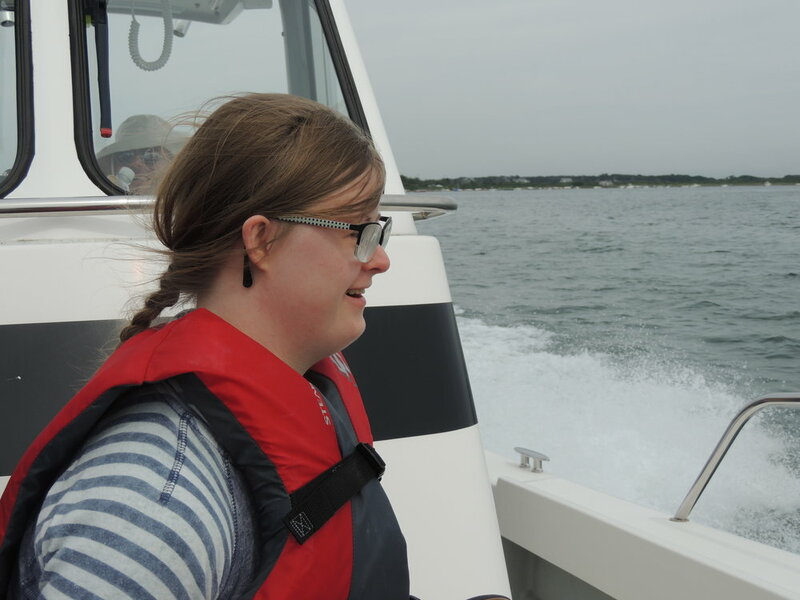 Grace also went on the boat today, and spent much of her time holding her hands out over the sea, using her Percy-Jackson-type-special powers to control the water. She said that Percy Jackson also went to camp and that ours is as cool as his. Meg noticed someone windsurfing today when she was on the boat. 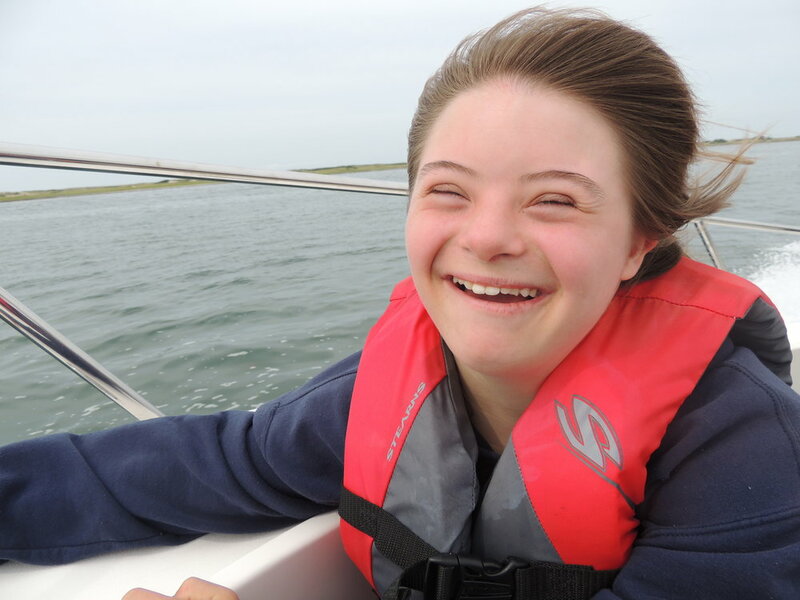 She would love to try windsurfing with Access Sports if she can. Candy shared her delight about going out for iced coffee with Meg, Rebecca, Rachel, Mike and AJ. Peggy’s mom came to dinner and told us how proud she is of Peggy, who has learned to read, is learning to count money, and has become a whiz on the computer. Many of us have seen emails from Peggy throughout the year and are happy that there’s an easy way to stay in touch. Today Ben, Jack and Gillian gave us our first room inspection. Overall, the upstairs rooms ranked much higher than the downstairs room. Someone expressed concern that Ben and Jack wouldn't be objective, but when Ben said the room he and Jack share had badly made up beds, a messy bathroom and an unkempt closet, we knew that they were fair judges. In fact, they were very picky and thorough judges - - they even looked into the under-the-bed storage boxes and rated those! Talia and Bob took the gold, Rebecca and Candy and Rachel took the silver and Billy and Lily took a proud bronze.I won't mention whose room got the big "NO" from Jack and the "dreadful" from Gillian. We decided we weren’t quite ready for a studio tonight after all, so we’re watching the end of Star Wars. That’s it for now! Today is Jamie's Birthday! Harry announced it and told us about a few other luminaries born on this day, including Whitney Houston. Gillian gave her a book as a gift from camp. In the Heart of the Sea, as we know from our trip to the Whaling Museum, is about the two crewmen who barely survived a terrible voyage where, in order to survive, they had to resort to cannibalism. Sarah (Peanut) gave us a more cheerful summary version of the book. "Now class! One day there was a whale and it met another whale who said, 'Whale, whale, go home.' So it did." Mike, AJ, Ben, Jack and Peggy started the morning with our first trip of this year in a motorboat thanks to Chris Shannon of Madaket Marina. Jack dubbed it a good time. AJ loved the boat ride, especially when they were speeding along in the water, and reported that he felt less pain when he was in the boat than when he is on land. 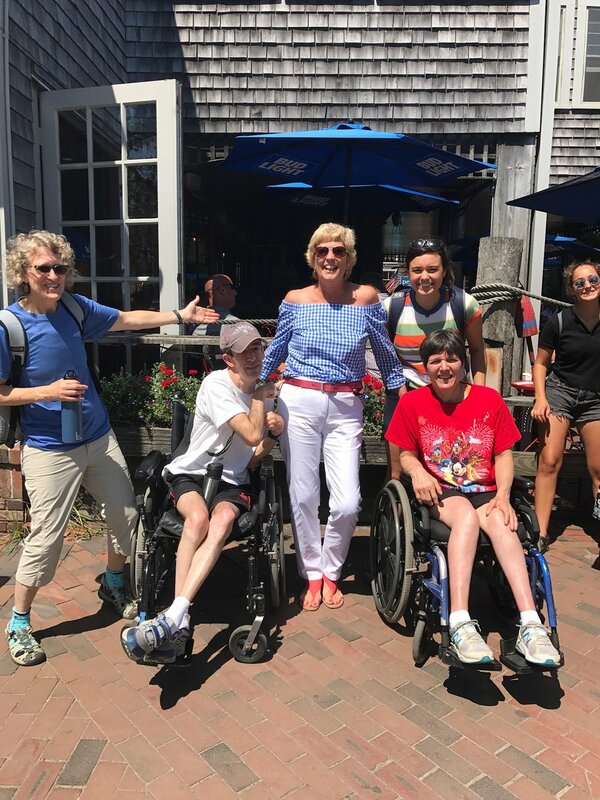 Peggy, our expert in all things Nantucket, reported that they saw Tuckernuck Island, a small, private island which has no roads, no public utilities and only about 35 houses on it. Pottery is now happening every day for about half the group at a time. While a few more whales were created, the popular creatures of the day were snakes and iguanas. They were all quite impressive and endearing. Grace made a vampire snake and Bob added stegosaurus plates on the back of his iguana. Peter wants it known that he made a cup for his sister. Ellen was quite focused on producing beads. The day's perfect skies and hot sun meant that everyone headed to the beach after lunch and rest. The chosen spot today was Brant's Point Lighthouse. Entry to the beach and to the water is easy and the passing boat traffic keeps the view dynamic and interesting. Steamship Authority ferries and Hyline fast ferries were mingled with every size and shape of sailing and motor vessels. Just a sidenote to say, "Thank You Steamship Authority!!" Did you know that they gifted us passenger tickets on their fast ferry for all our trips back and forth to Hyannis??!! Truly a splendid gift! And the Hyline has given us free tickets for the people who need to travel between Martha's Vineyard and Nantucket. Thank you!!!! 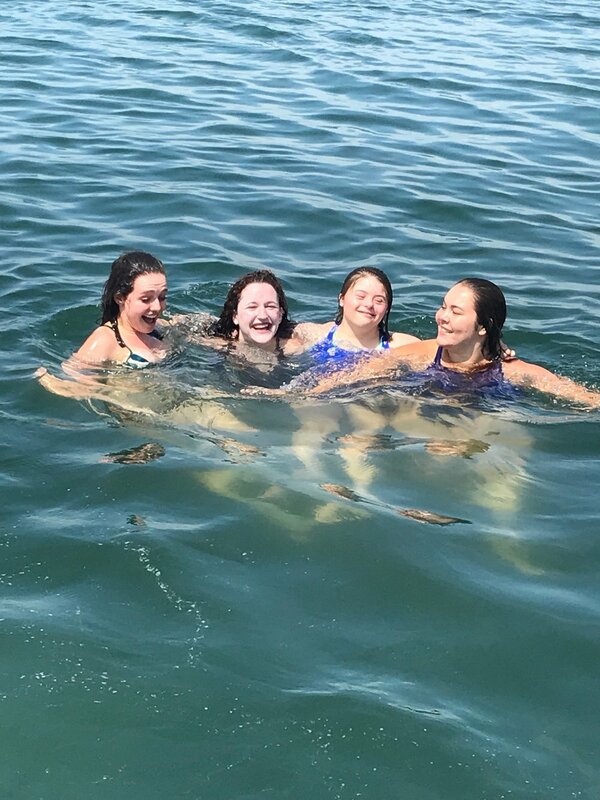 Back to our afternoon: It was amazing how long everyone stayed in the water, but the prizes for pruniest fingers go to Grace and Sarah, whose energies never flagged! Grace kept up a steady stream of "Ahoys" while waving at all of us and every passing boat, perched on "boats" also known as Ben, Mike or Monik. We all admired Sarah's rapid and efficient somersaults and her ability to hold her breath for a crazy long time. Rebecca floated happily in her tube, as did Bob. Jack alternated between his beach chair at the edge of the sea and the tube. Peggy had a lengthy swim and then enjoyed some peaceful contemplation on her towel, as did Candy. Meghan and Madysen read a bit of a book, and Peter, wearing shorts (YAY!) supervised from a big tired wheelchair. AJ swam for a long time and then asked Mike to bring him to the right depth of water to try walking there. He hadn't done that since he was about 16, and looks forward to doing it again. 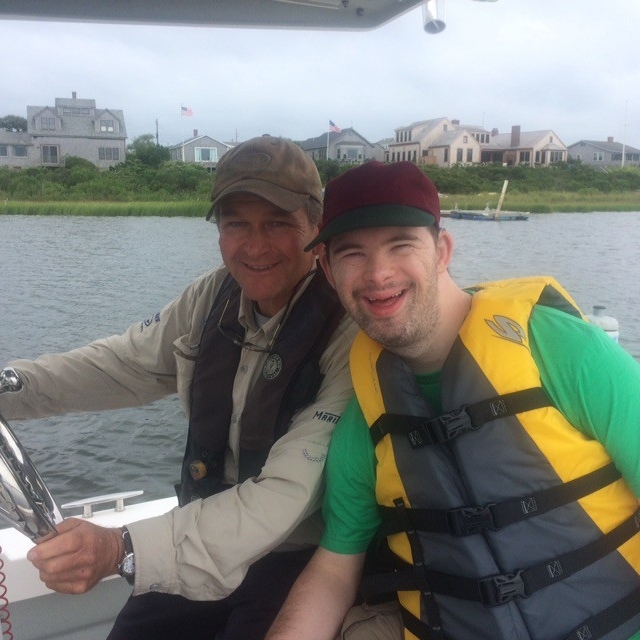 AJ usually struggles with chronic pain but when he's in the water he isn't! 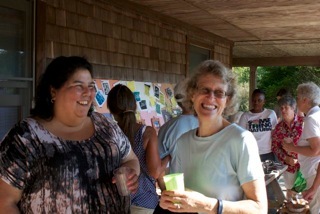 We joyfully enjoyed a delicious dinner prepared by special guest chefs, Ellen's guardians, Kathleen and Mike. The stories they and Ellen's other guests told were exceptionally fun and well-told. I'll just share the conclusion of the story told by Ellen's ten-year-old relative: He likes dogs better than grown up humans because when you wake up dogs, they're ready to play, whereas woken up grownups tend to be grouchy! 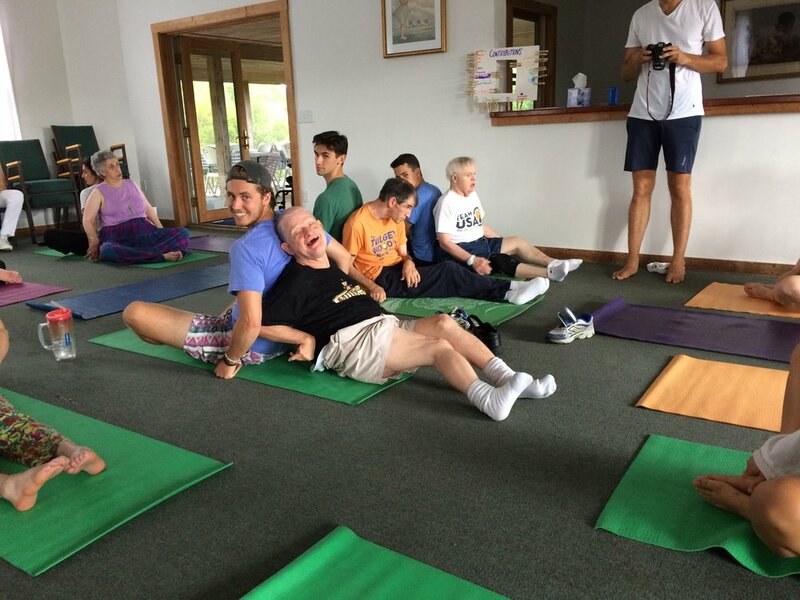 Three cheers for Peter who stretched out on the floor during yoga! Another first: Gillian came to music class just as it was ending and declared that our new song, "Can't Stop the Feeling!" sounded "Grand!" Today is the day that the Collopy Cup National Connect-4 Tournament begins! The winner will take home the Collopy Cup. Billy rejected the idea that the winner could win his treasured connect-4 t-shirt. This afternoon was cool and cloudy, so one group held a "Happy Hour Plus Olympics", featuring tea, chips and men's gymnastics. Another group went to town and handed out postcards to advertise our upcoming concert. (It's on August 15, just in case you're planning to join us!) They walked in and out of numerous stores, where salespeople asked, "Hi, can we help you?" And they answered, "Yes, we want to invite you to our concert." They found lots of interested recipients who promised to come, including the eye doctor who kindly fixed Meg's and Ruby's broken glasses. 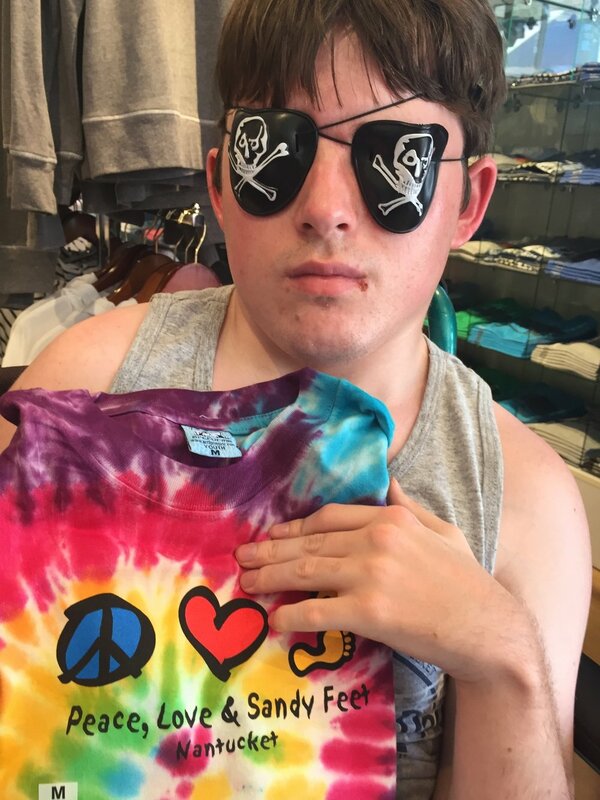 When Billy, Lily, Ellen and Katie went out for their boatride, Captain Chris gave lucky Billy a Madaket Marina sweatshirt. Such a treat! When the town group got back to camp, out of the blue, Madysen got hurt - - a dislocated knee! :( It was upsetting for all of us, and agony for Mady. Mike and Lily took Mady down the rutted road to the hospital as smoothly as possible. To keep the distress to a minimum afterwards, lots of people played games on the porch until dinner. After dinner, Rebecca acted out the different elements she'd seen the men perform in gymnastics and Bob showed us how the men cheer for themselves. Mike's mom, Deb, and AJ shared the Spanish phrase AJ learned in Spanish class this morning: "Me alegro que estas aqui!" 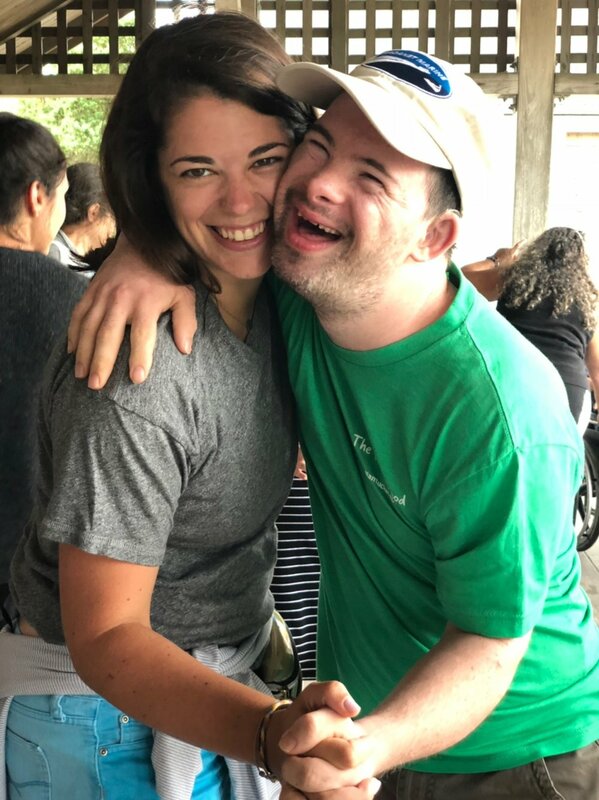 Jack was delighted when Deb gave a daily reading from the Bible about how giving makes all of us joyful. 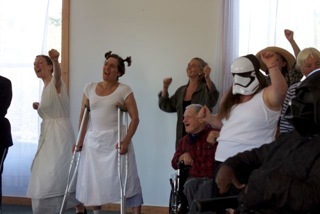 Sarah completed the evening stories with the announcement, "Okay, class, guys, today, tomorrow, tonight we're watching "Star Wars!" You'll be laughing so hard, Ha Ha Ha. So, listen, everybody listen! Clap your hands, stamp your feet, let's go watch the moive!" We watched the first half of "Star Wars" until bedtime. Although Mady returned from the emergency room after bedtime, the news spread and many of us gathered around her to deliver our hopes for a speedy recovery in person.